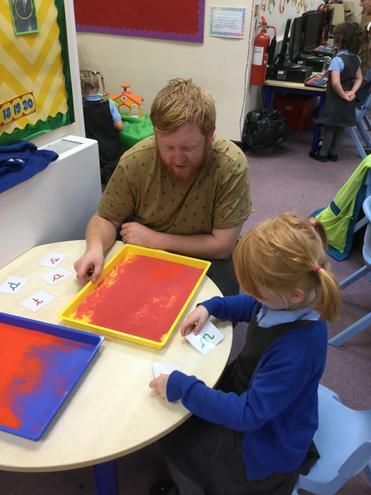 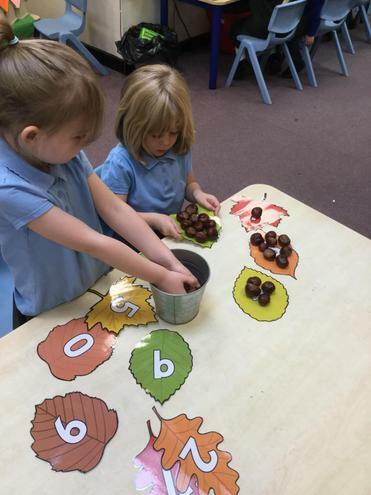 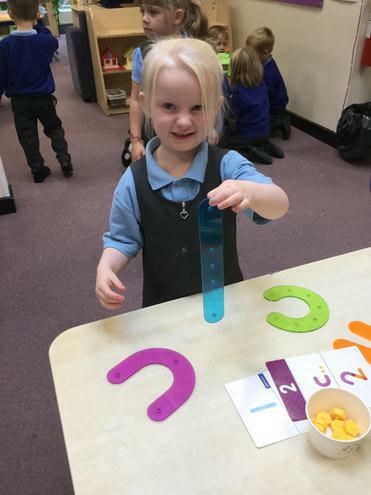 This half term we will be focusing on learning the sounds of the letters, how to form them correctly and how to blend them together to help to read. 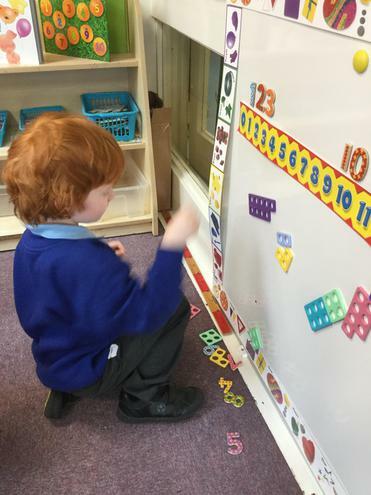 This half term we will start to learn our numbers, we will learn to read, count, write and begin to understand the value of numbers. 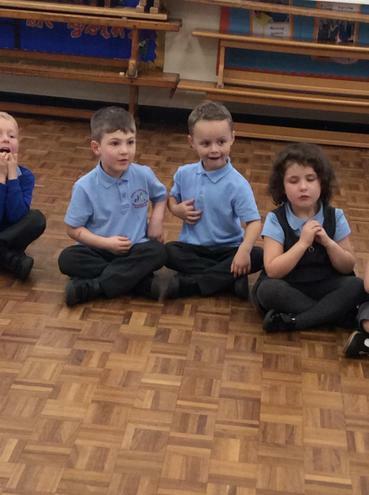 Language and good communication skills are one of the most important life skills we can learn. 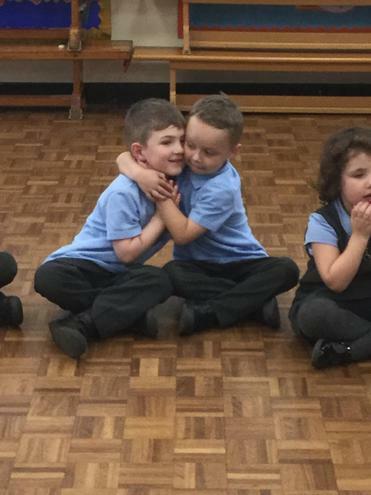 The ability to connect with people and to effectively communicate our ideas to others will affect our personal relationships, our confidence and feelings of self-worth, and our cognitive development. 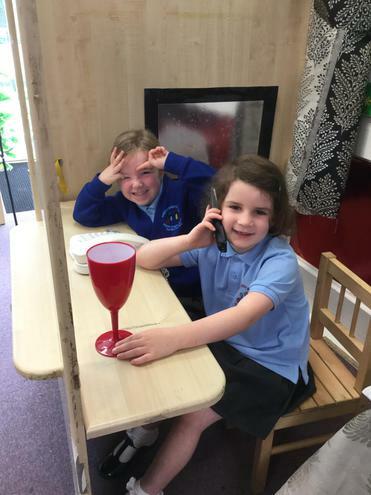 By talking we can communicate and negotiate our needs and wants successfully. 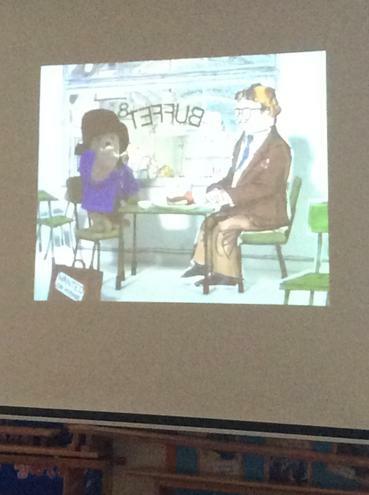 We need to feel that we are heard. 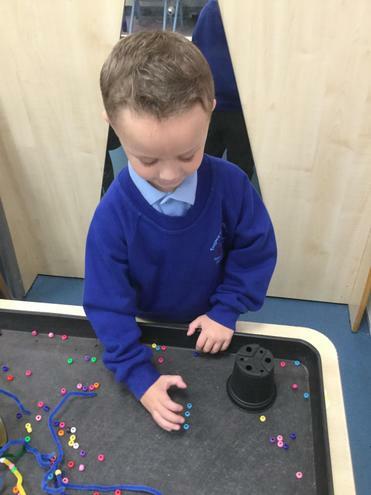 When you are able to take part in the thinking and learning that is going on in the classroom, your knowledge tends to stick as you are an active participant in your learning. 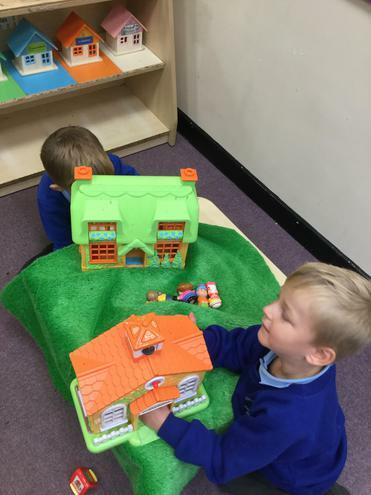 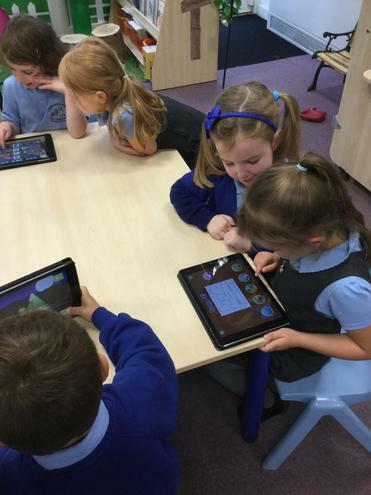 Chattering Children invites children to explore language through play. 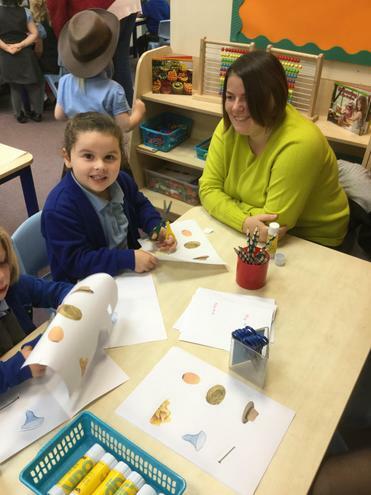 The aim of the unit is to remind you of the value of talk and the importance of using words. 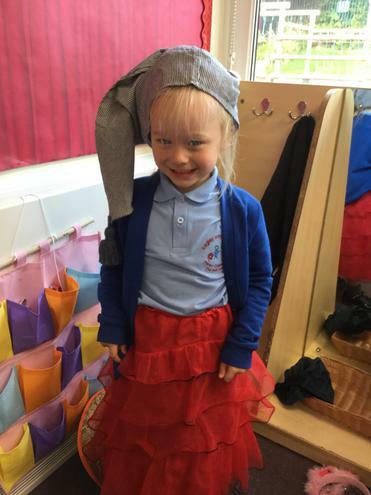 Well, we can’t believe what happened this week! 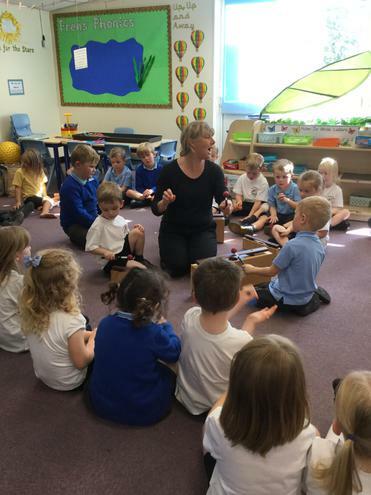 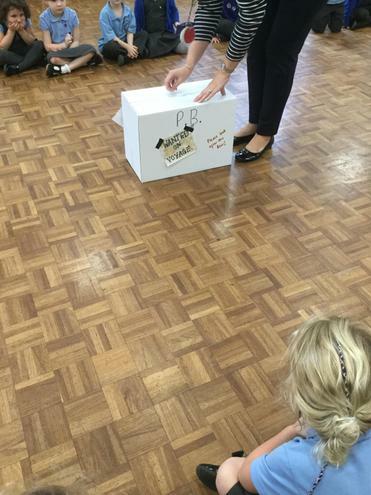 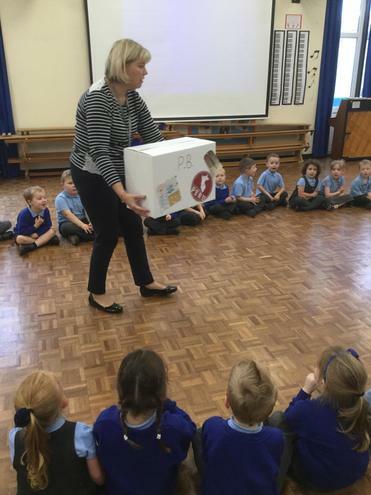 Mrs Worthington came to our classroom with a large box that the postman had delivered. 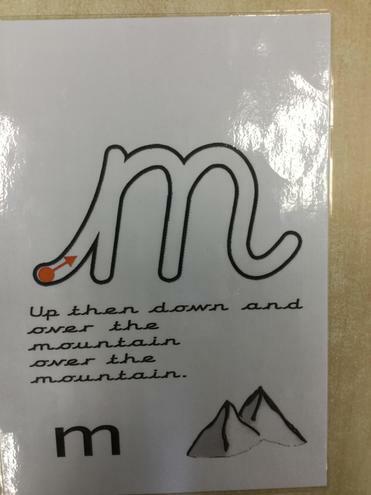 On the box it said it had come from Peru. 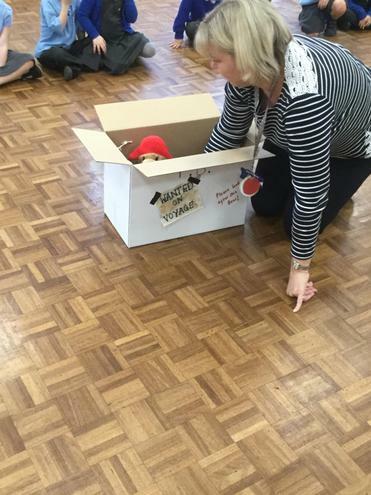 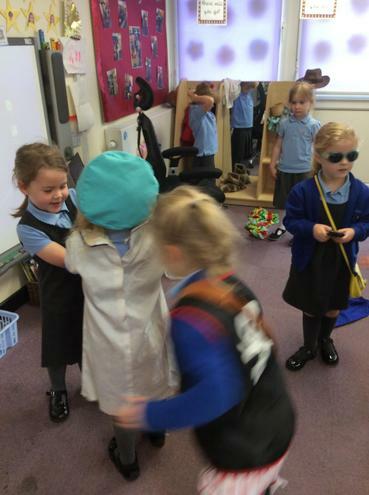 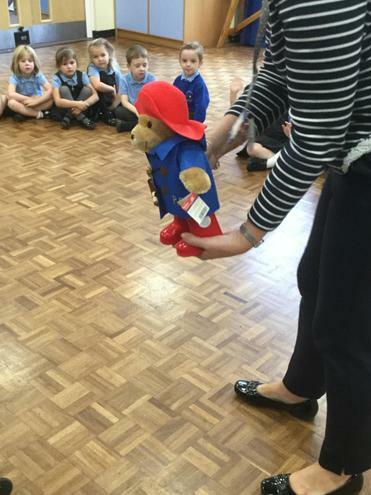 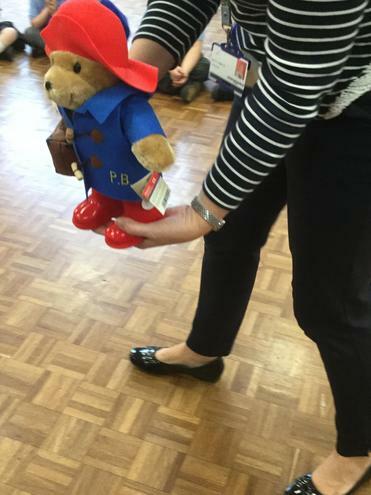 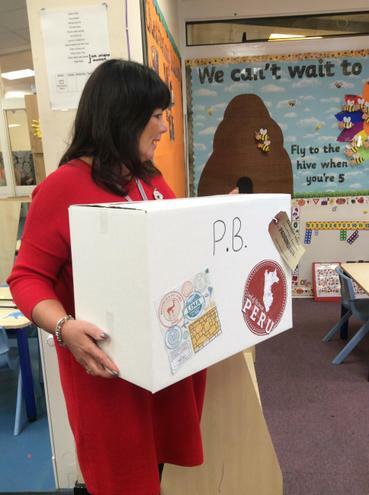 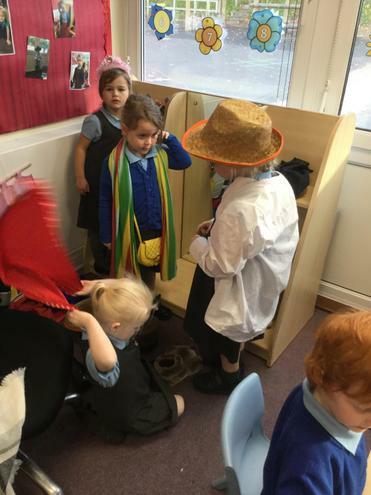 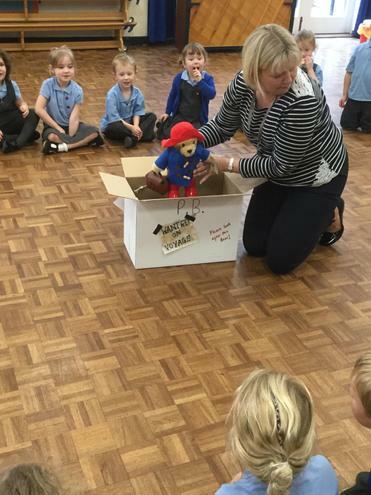 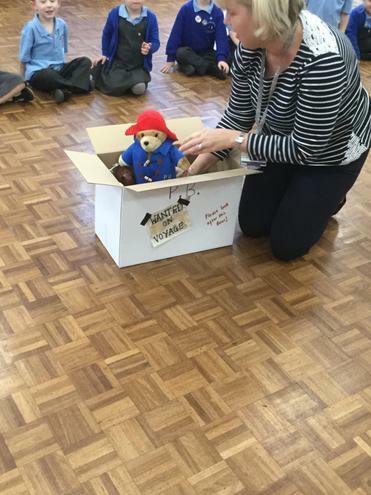 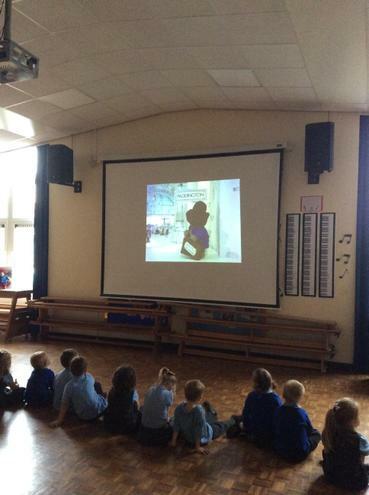 We all went into the hall and Mrs Tibbitts open the box and inside was Paddington Bear. 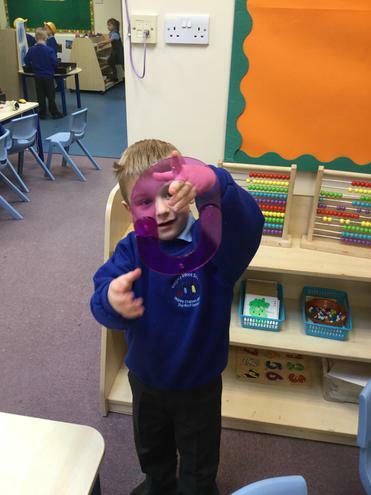 He has come to visit us! 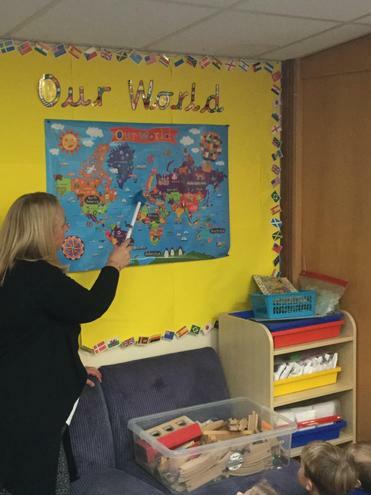 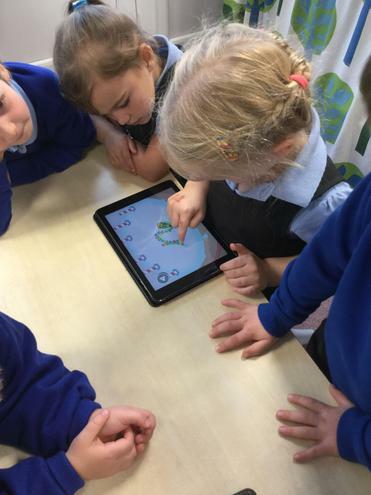 We looked on our world map to find out where Peru is. 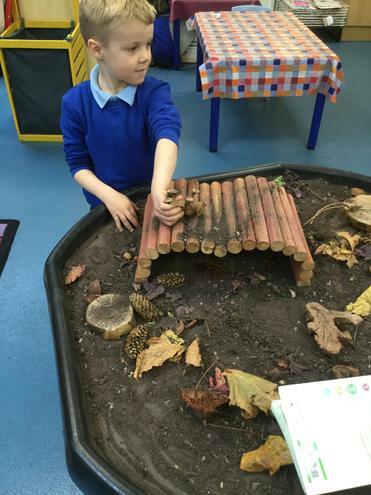 Later on in the week we have found out all about dens, just like the ones real bears live in. 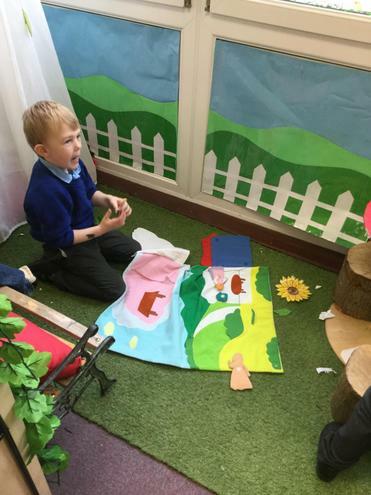 We designed our own den and then we used our design to have a go at making our den in the outdoor classroom. 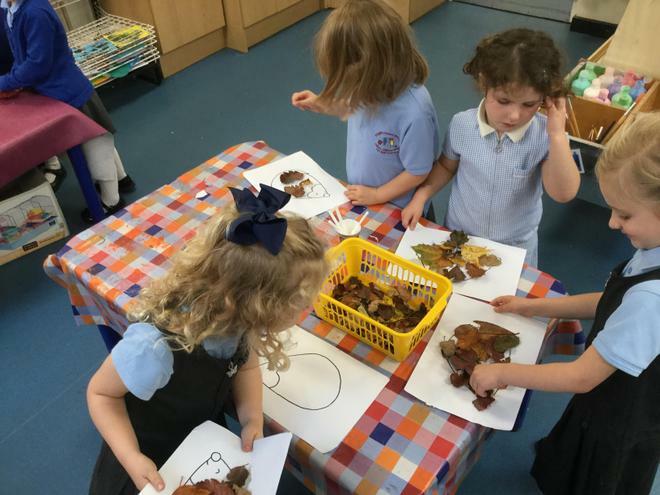 In English we started the week with a story Squirrel’s Autumn Search. 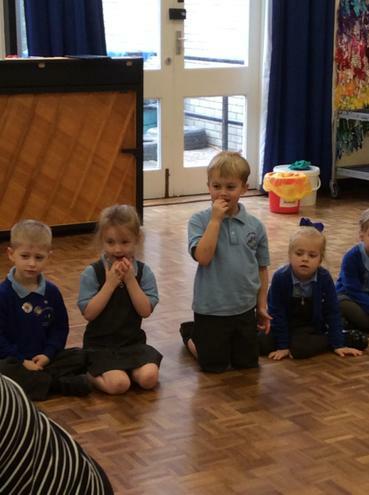 Then as the week went on we learned 4 more sounds. 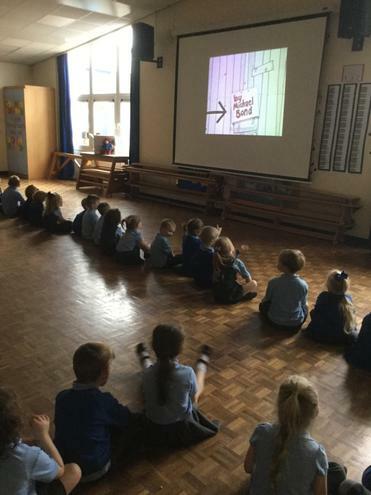 We have been showing our teachers all the sounds that we have learnt and remembered. 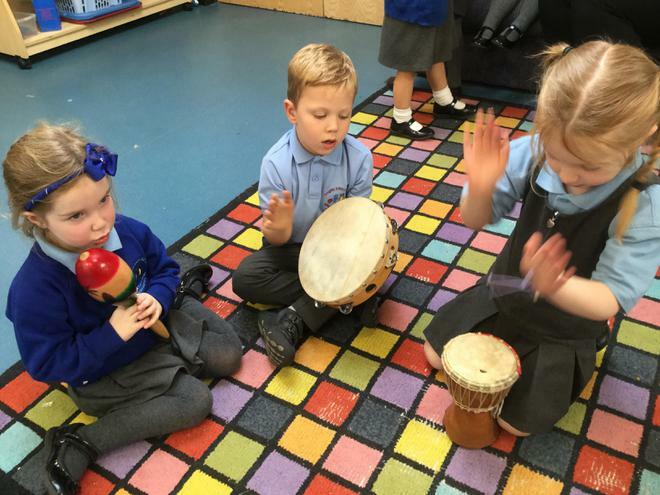 At home over the holidays, please practice the sounds we have learnt so far. 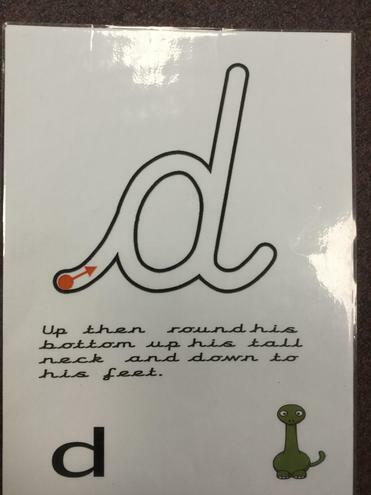 On the first Friday back after half term, it will be our first 5 read challenge. 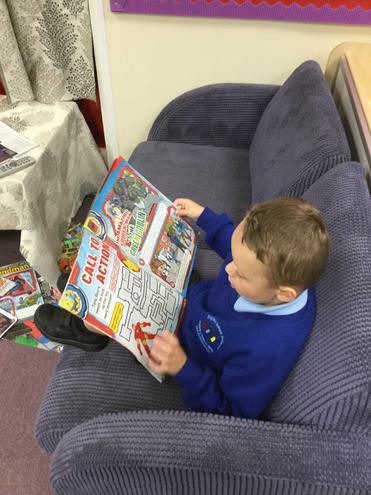 On the morning of Friday the 2nd November we will collect all of the children’s reading diaries and check to see who has completed the 5 read challenge. 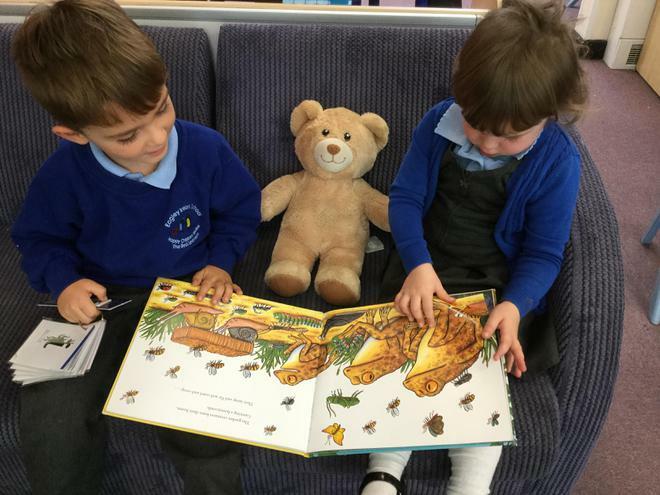 This means, if your child reads their reading book, at home, 5 times from 26th October to the 2nd November and it has been recorded 5 times in their reading diary, they will have completed their first 5 read challenge in Reception. 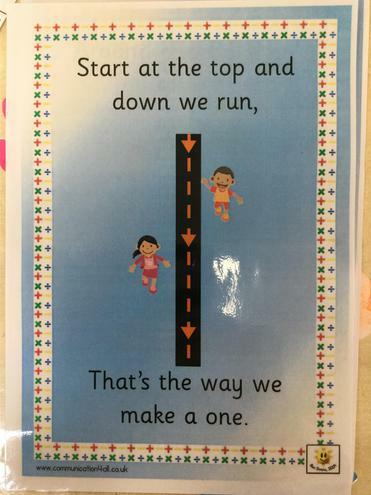 They will move to the first ‘Up, up, up and away balloon’. 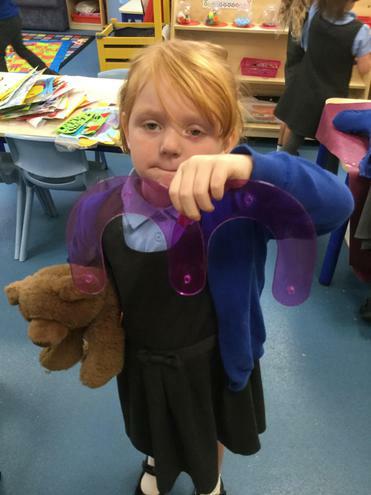 Each week the class with the most children completing the 5 read challenge will receive the very special 5 read challenge trophy and it will be shared with parents on our newsletter. 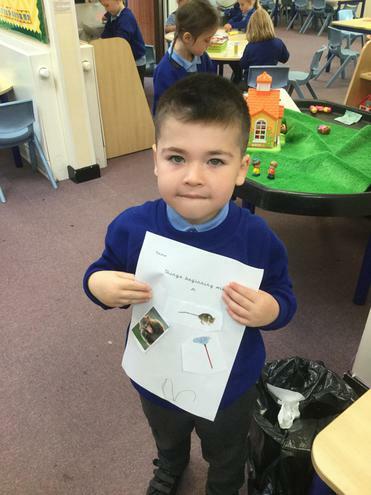 More information is in the letter the children brought home. 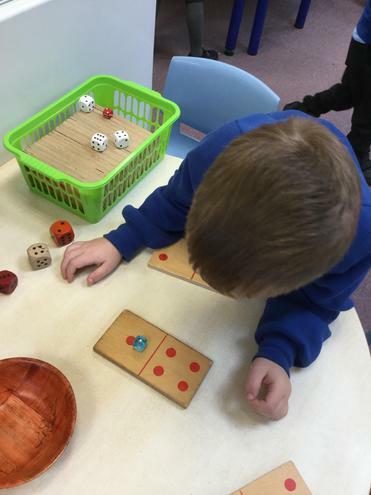 In Maths our number has been number 4. 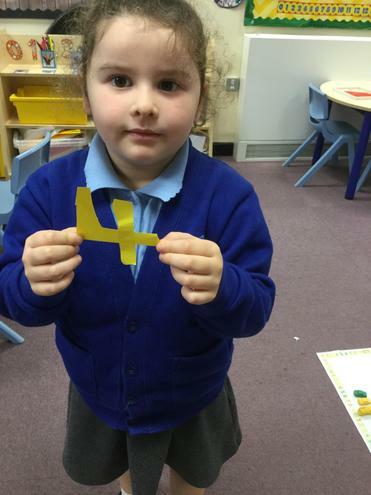 We have shown lots of different ways of representing 4. 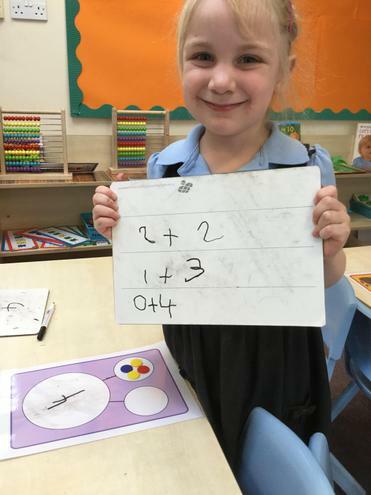 We have compared 4 to 3,2 and 1. 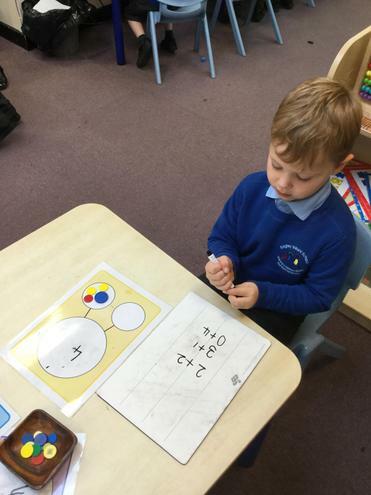 We have used the vocabulary less than, more than and greater than. 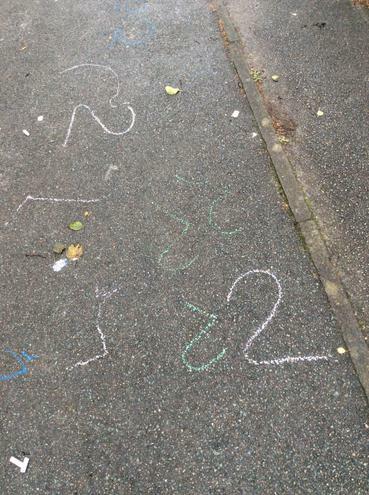 Lots of children were able to tell us that 4 is 1 more than 3. 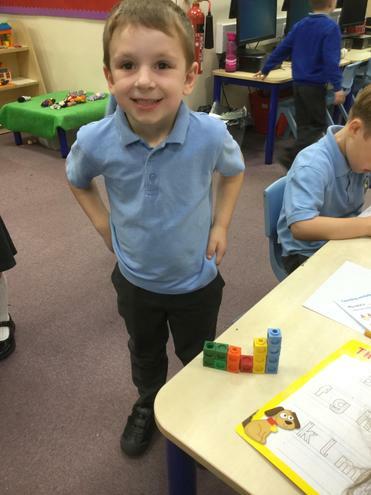 We have used our part part whole model to find the different ways of making 4. 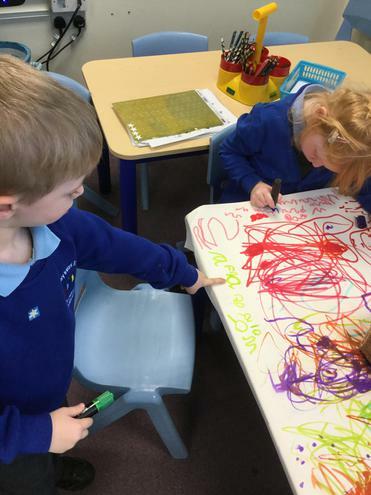 Some of us then recorded the ways we had found on a whiteboard. 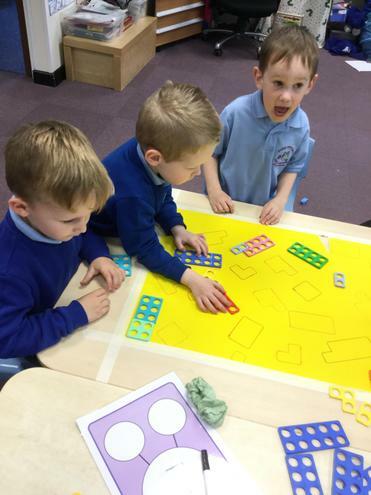 At home you could make your own part part whole model and find different ways of making the numbers we have focussed on so far. 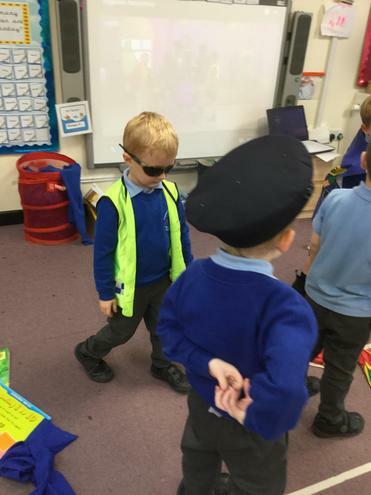 How could you record this? 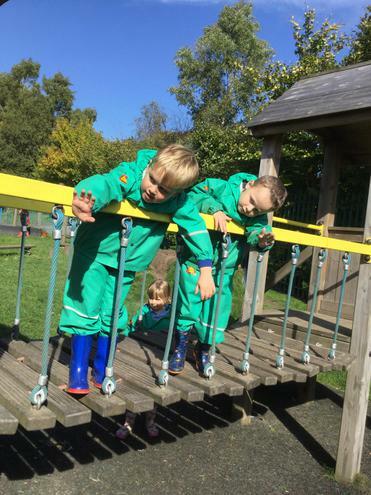 We hope you all have a lovely half term. 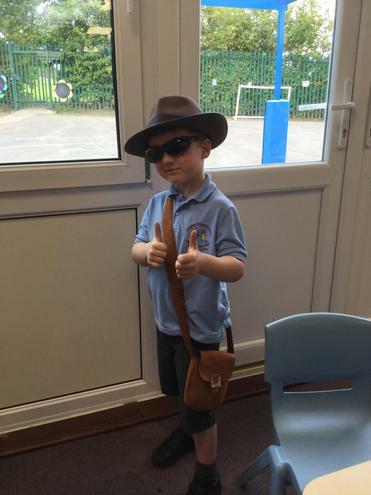 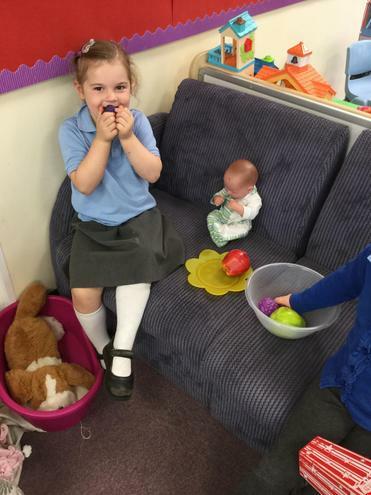 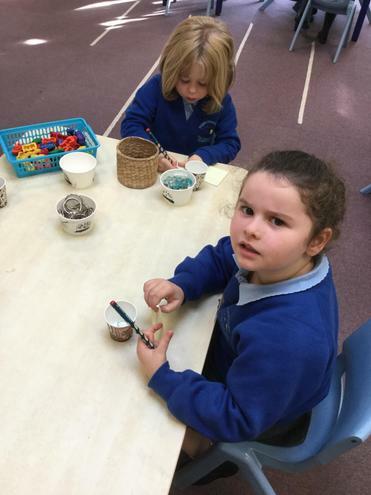 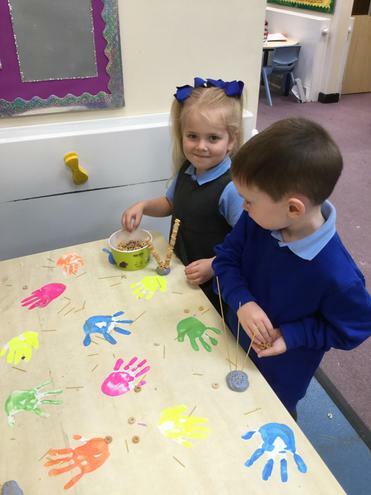 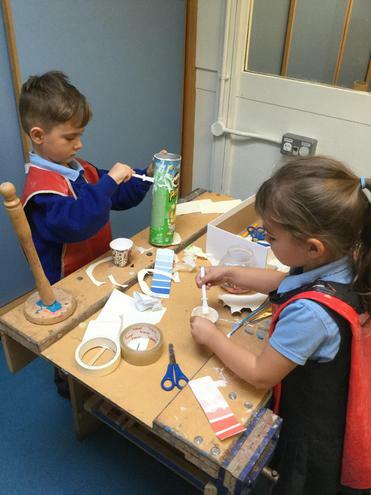 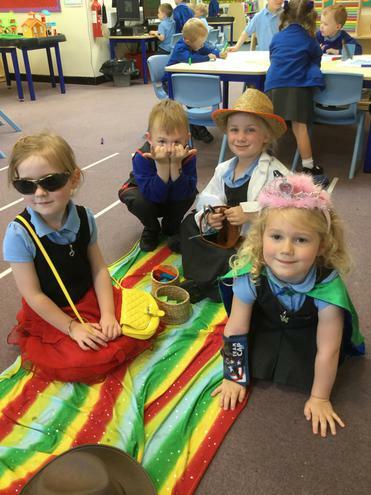 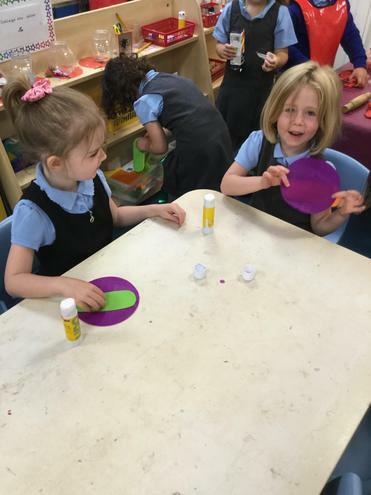 The children are definitely ready for a break as they have worked so hard during their first half term at school. 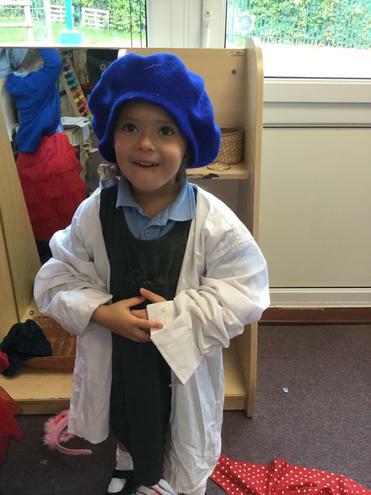 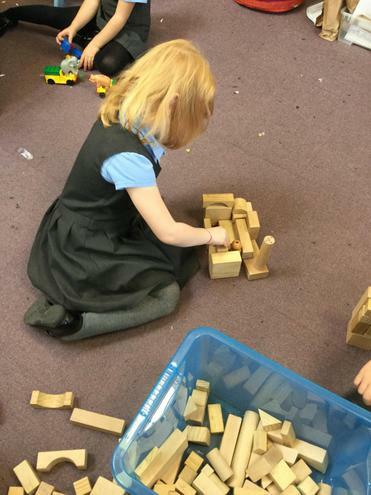 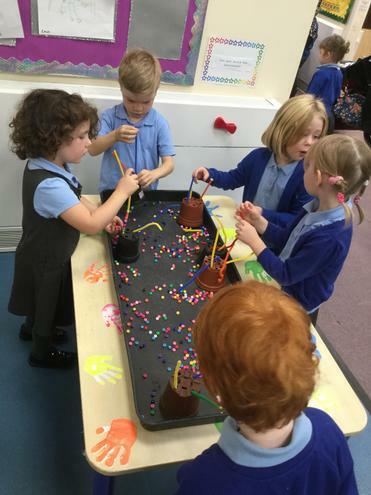 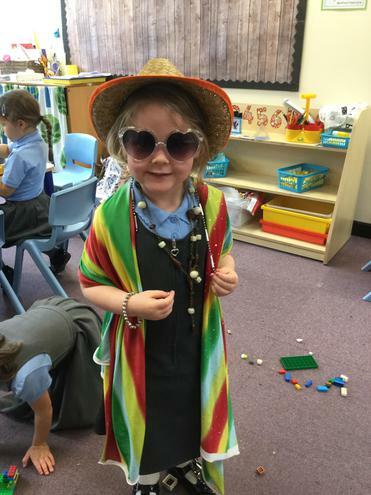 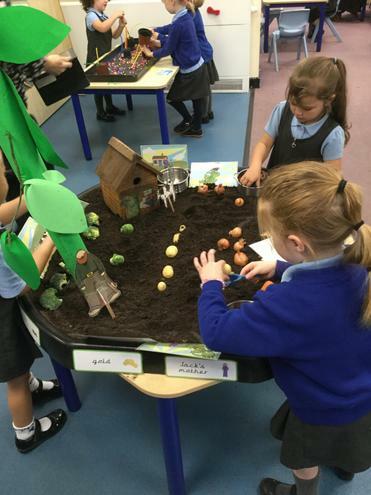 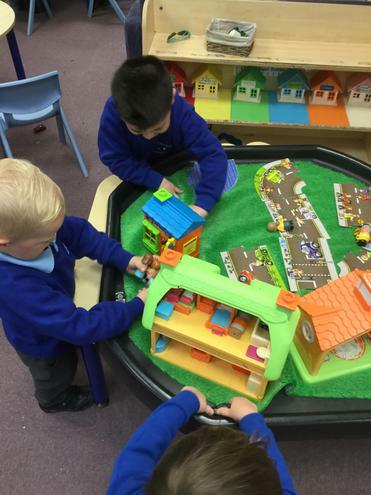 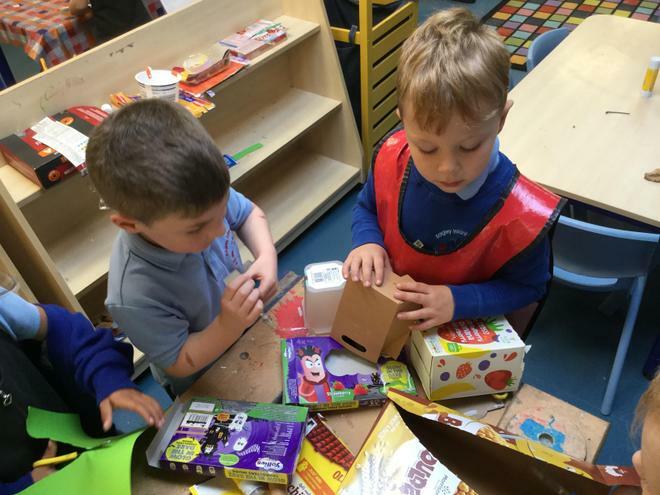 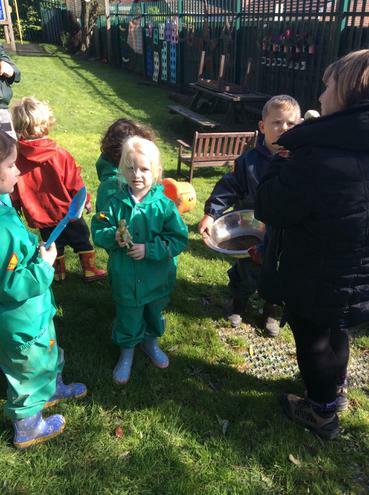 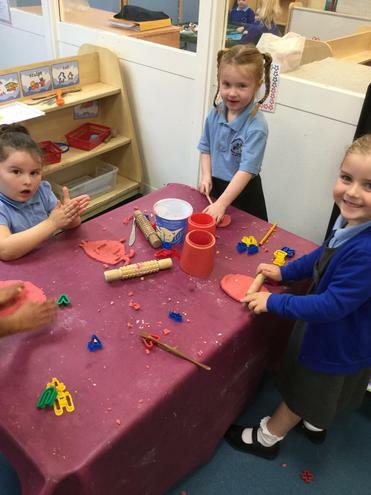 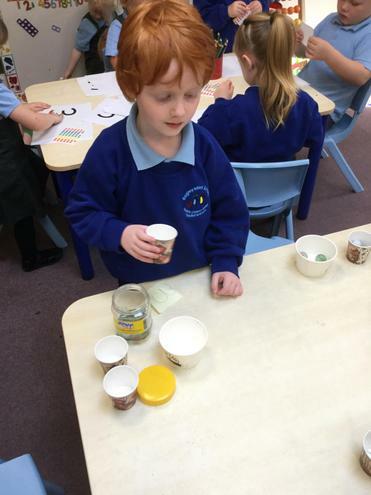 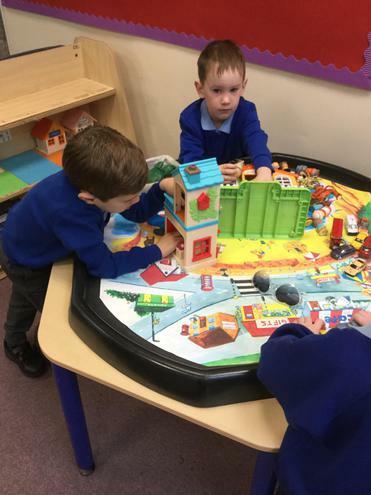 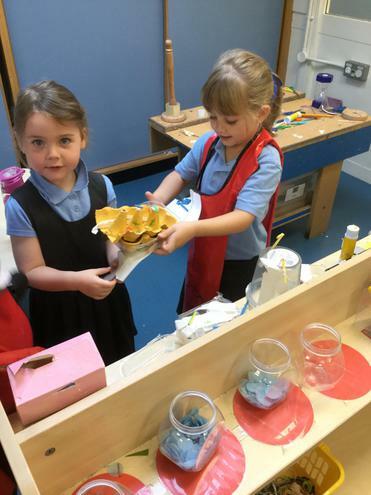 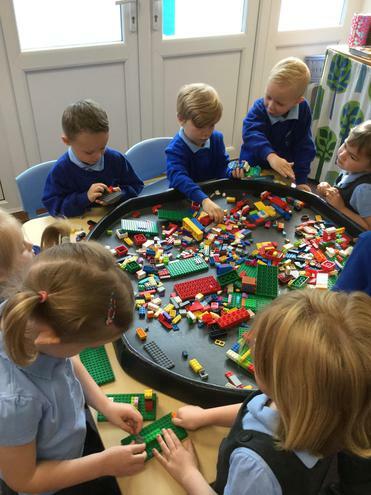 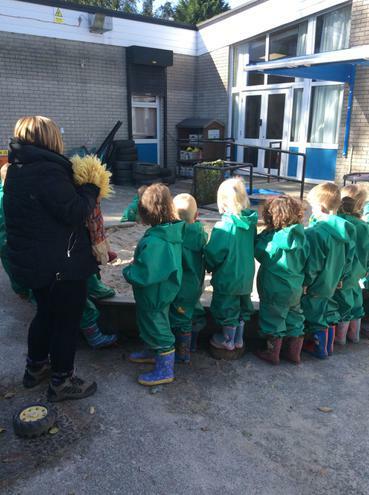 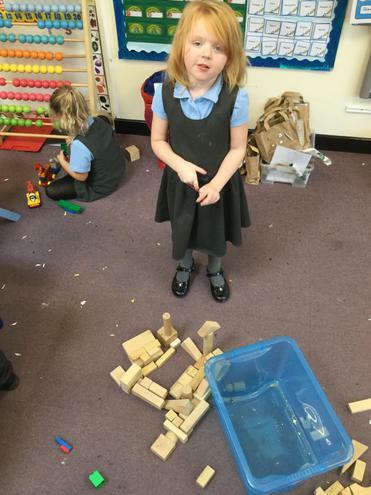 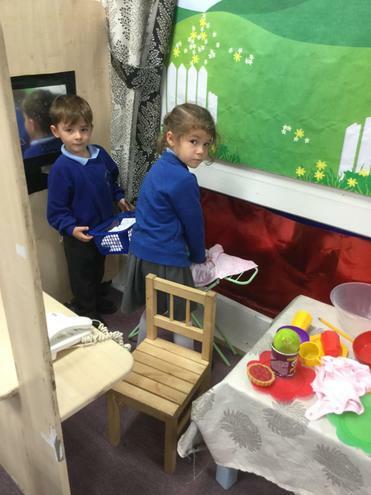 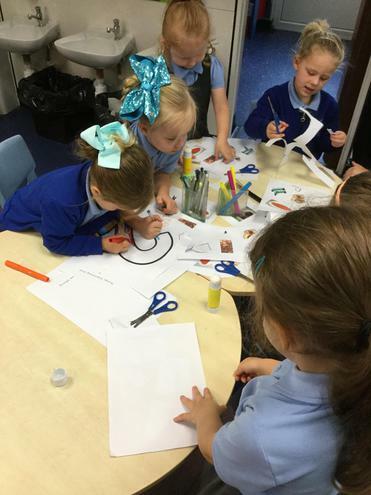 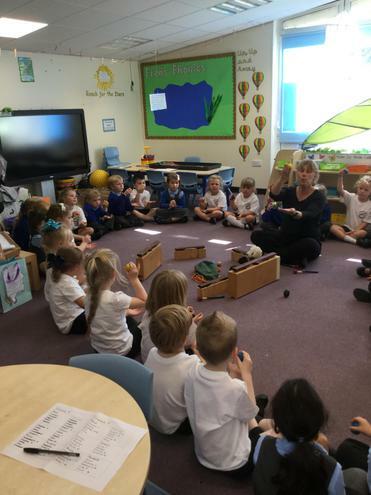 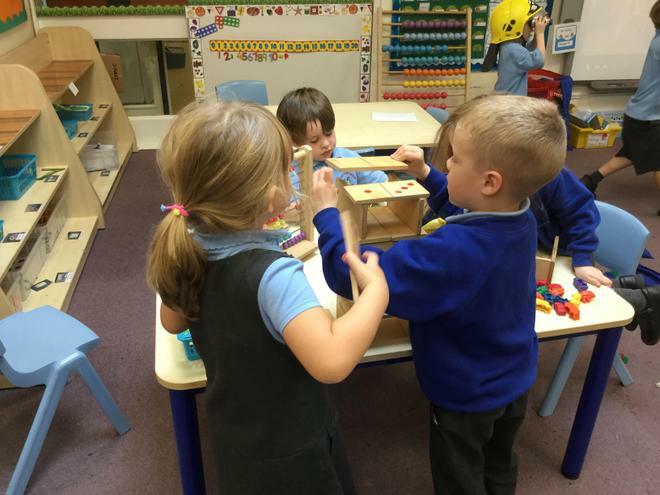 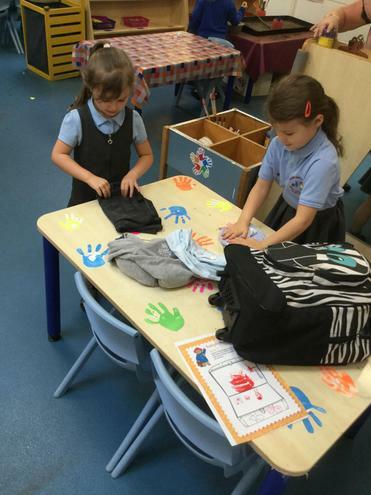 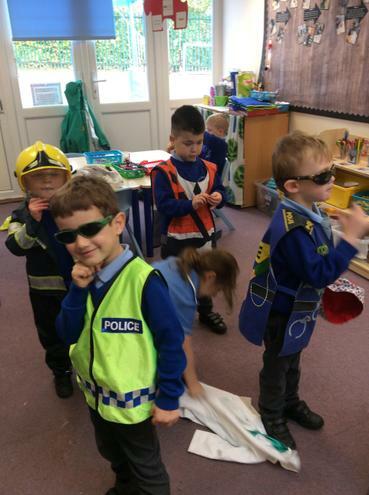 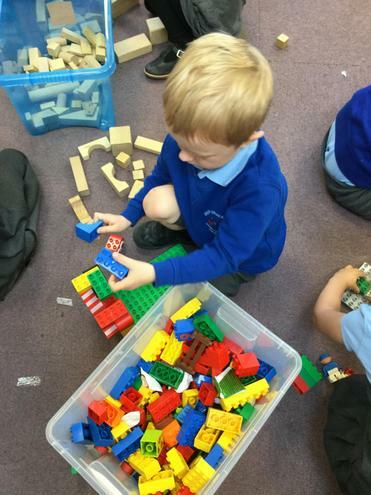 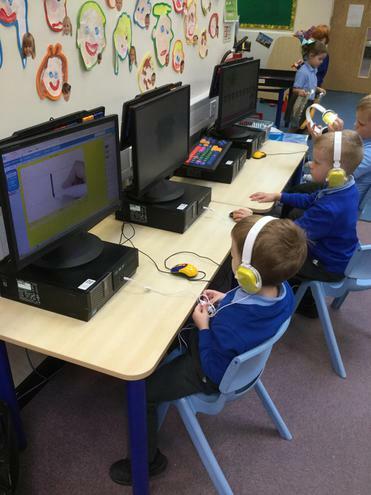 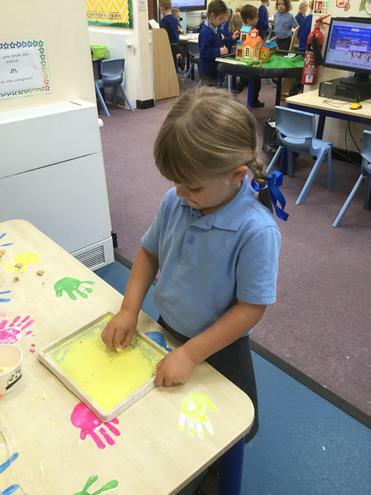 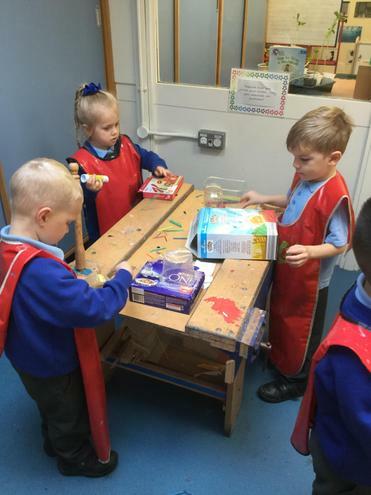 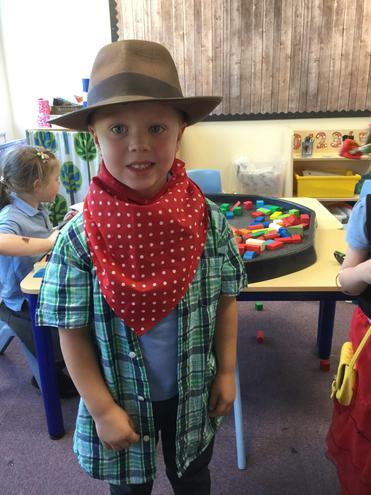 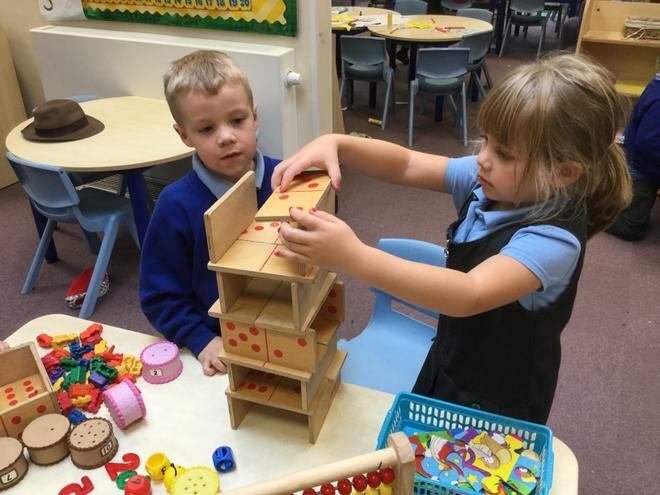 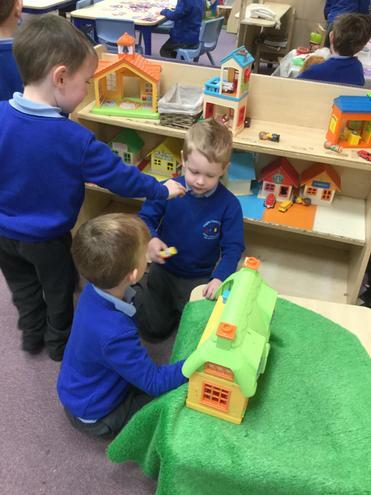 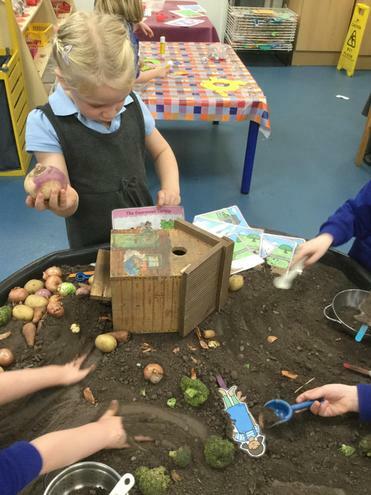 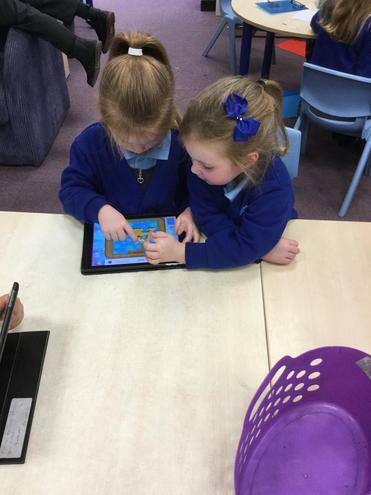 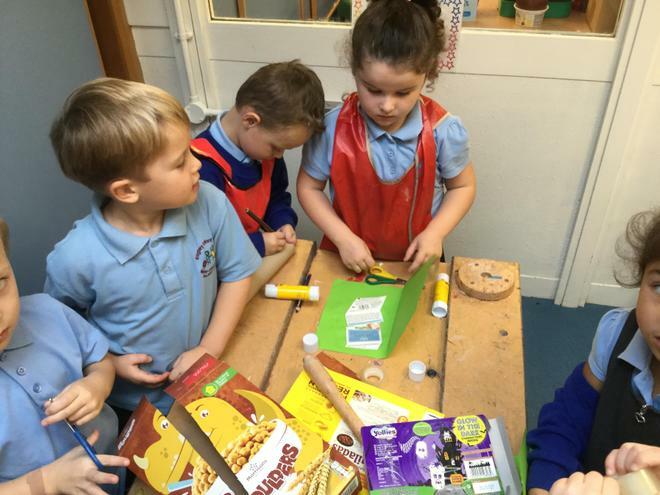 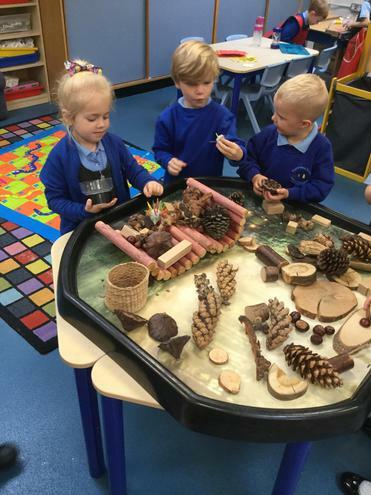 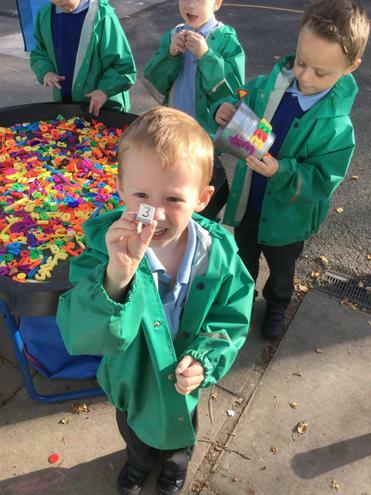 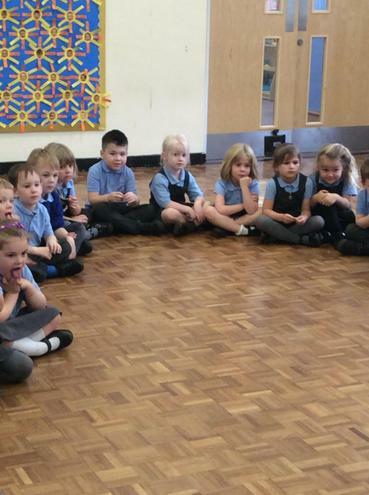 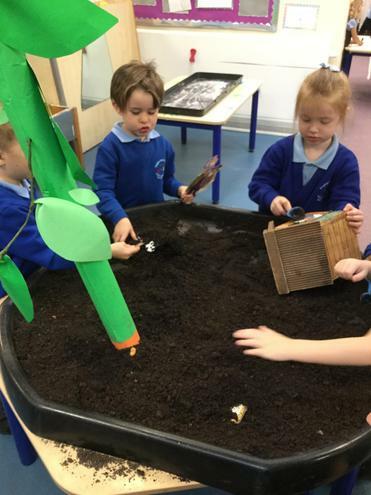 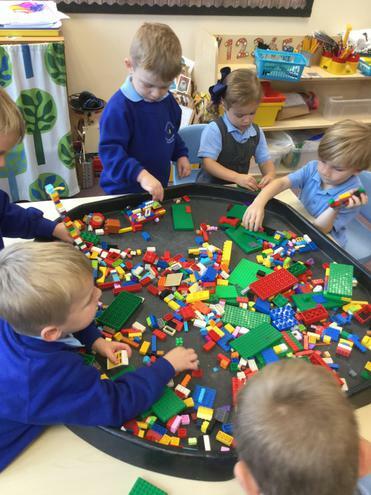 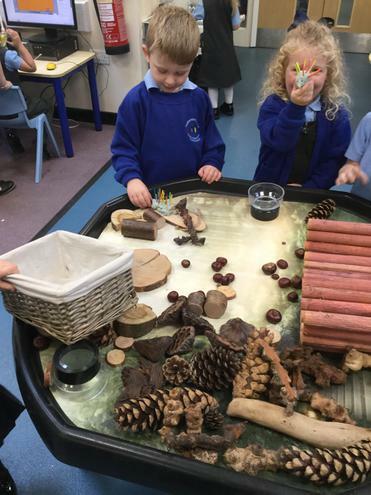 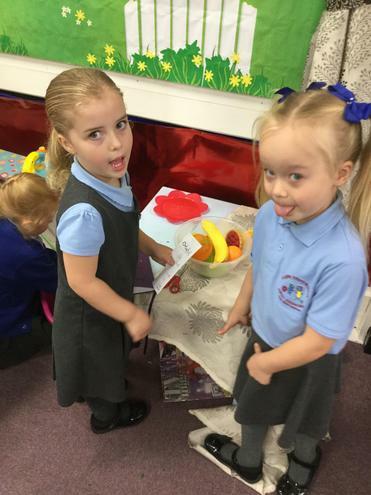 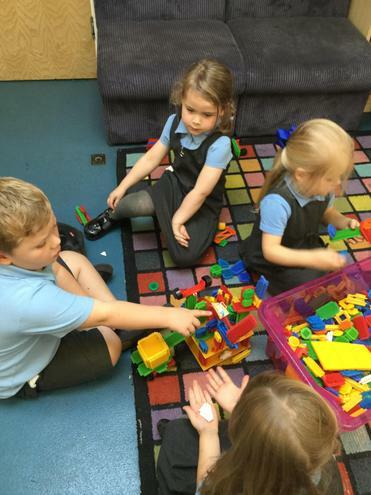 It has been another super week of learning for our reception children. 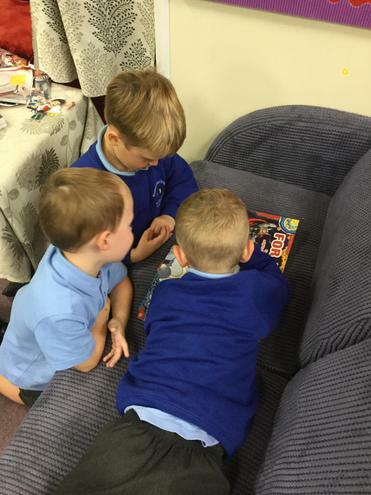 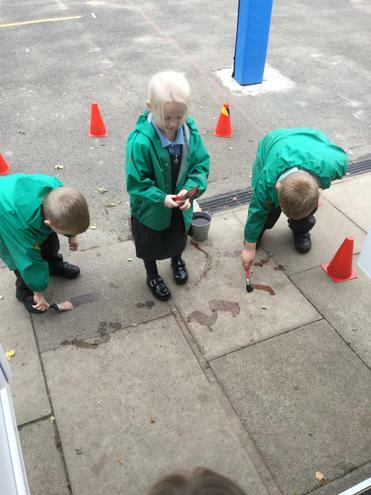 We are so proud of how well they are all working together and enjoying their learning. 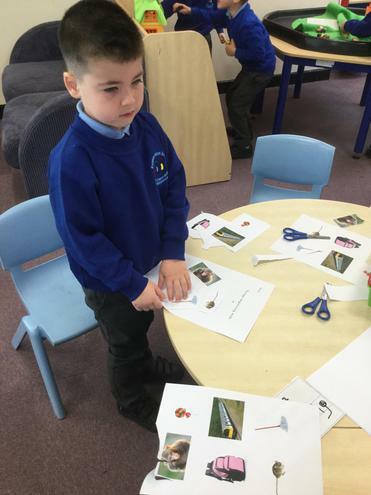 In English this week we have learnt 5 new sounds! 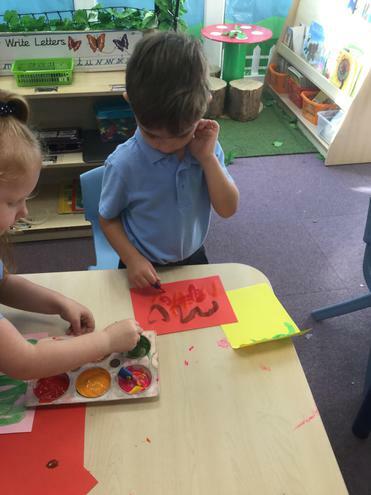 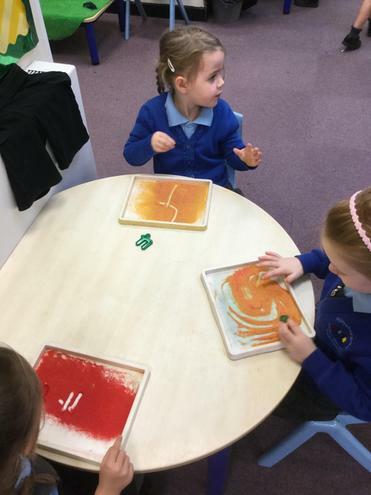 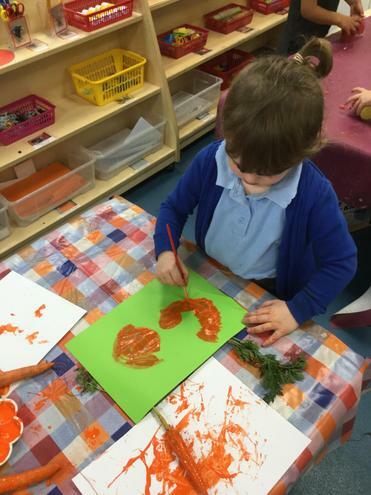 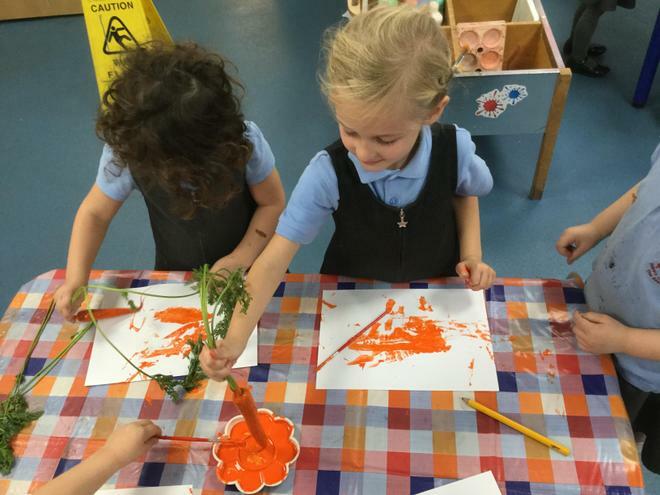 We have been practising writing these sounds with special finger paint brushes. 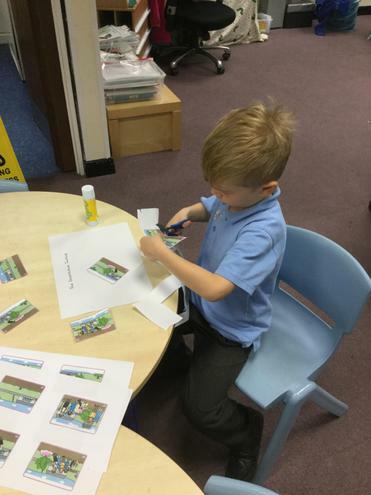 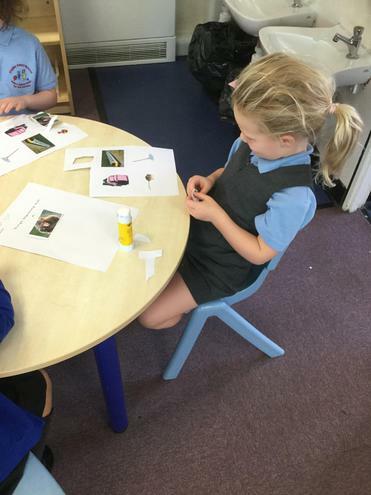 We have also been labelling some pictures. 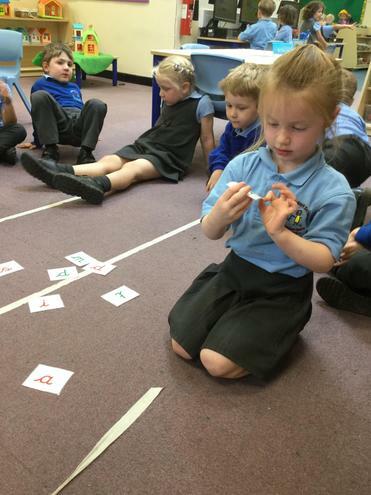 Lots of us are hearing the initial sounds in words, for example 'p' pin. 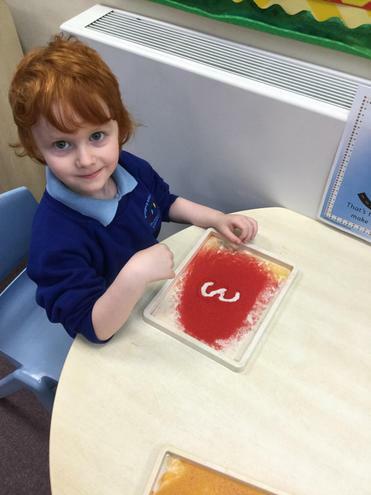 Some of us have been able to hear and write the 3 sounds in each word. 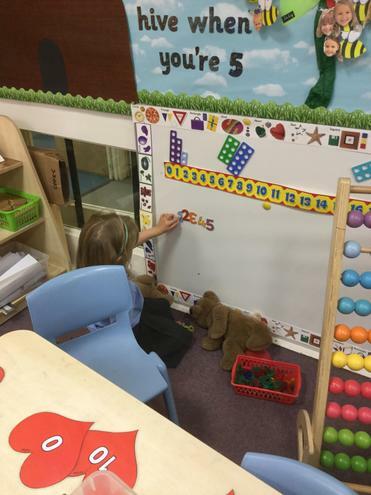 At home you could continue to practice this by labelling things around your home like your toys. 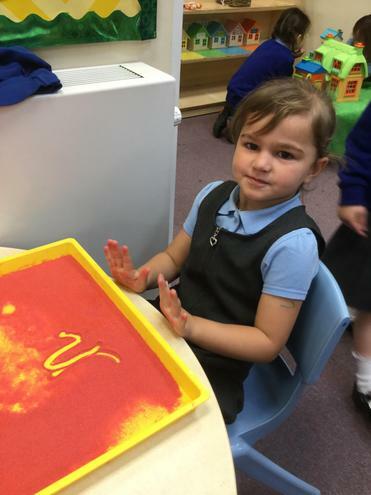 Adults could encourage the children to think about what letter sound they hear first in each word and write these. 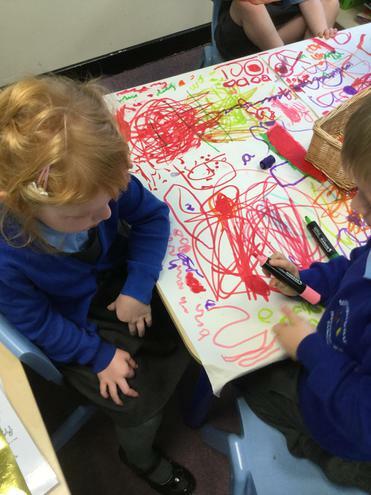 Maybe you could have a go at writing all the sounds you hear in each word. 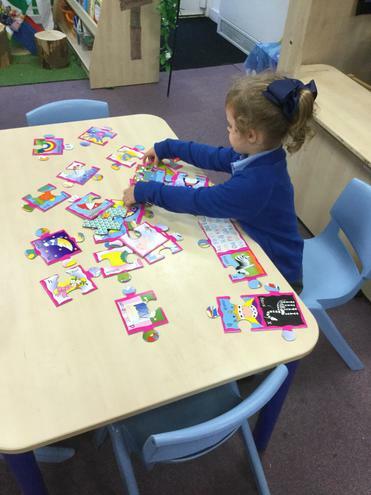 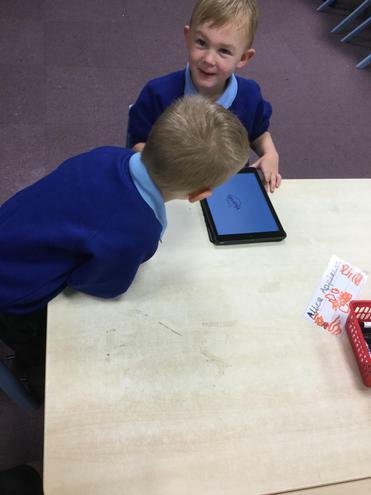 Don't forget to keep practising with your sound cards and making words to read. 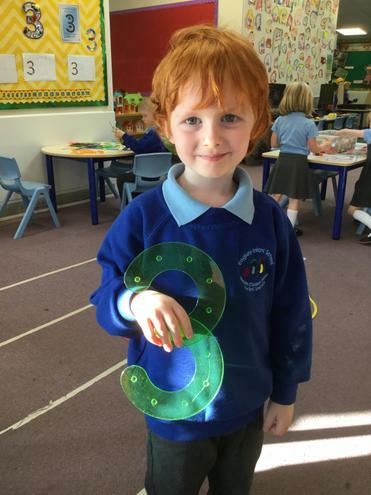 In maths we have focussed on the number 3. 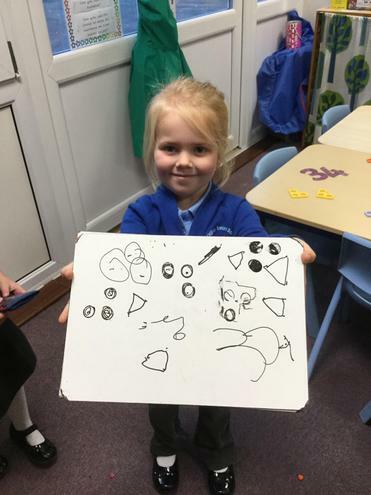 We have practised forming the number correctly as well as using the part part whole method to find different ways to make 3. 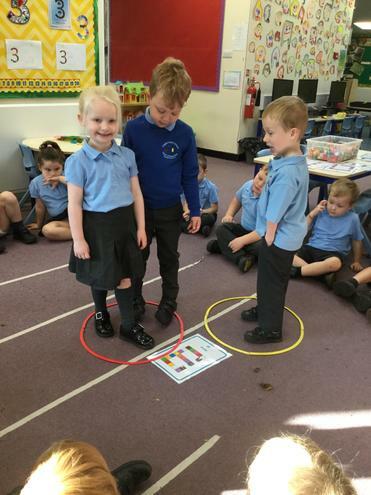 We used the Numberblocks to compare the numbers 1, 2 and 3. 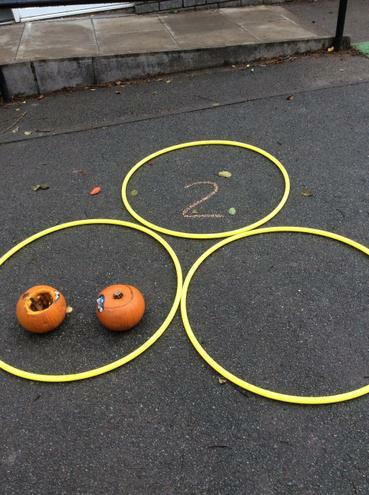 We discussed how 3 was greater than 2 and 1 and that 1 was less than 2 and 3. 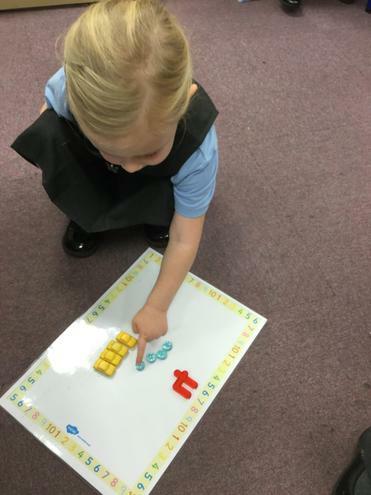 At home you could make sets of 1, 2 and 3 and compare these at home, encouraging the language, more than, greater than and less than. 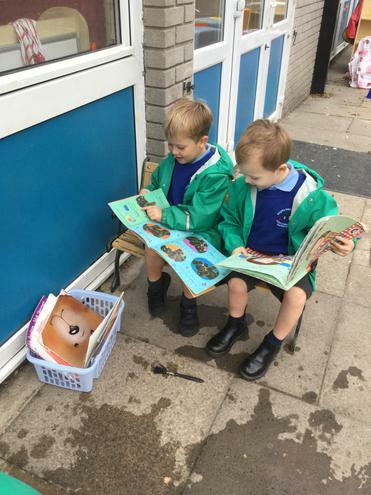 Currently, your children have their reading book changed weekly, please ensure that reading books and reading diaries are in reading packets every day. 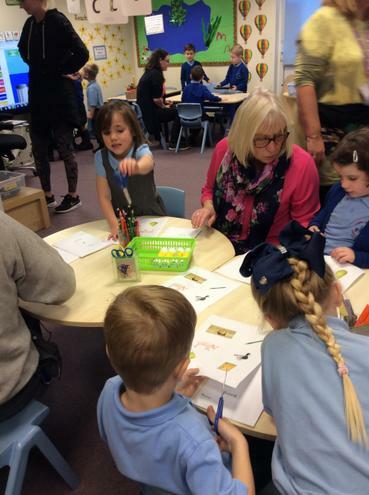 Could we also ask that when you have read with your child that your write in their reading diary so that we know how they are getting on at home. 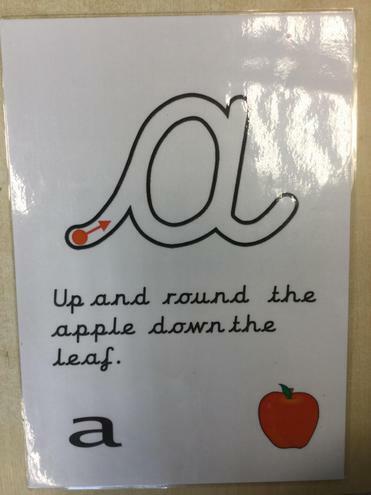 In English this week we have continued to learn 5 more letter sounds. 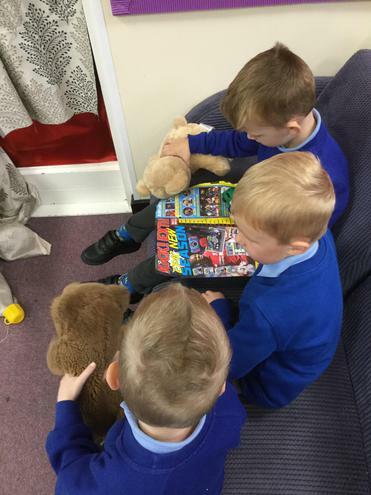 We have been helping 'Fred the Frog' read words using the sounds we have learnt. 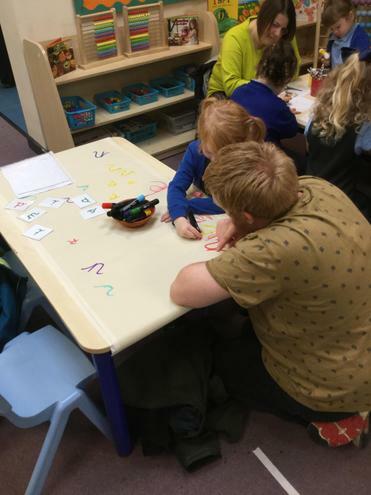 At home please practice forming these letters correctly, you could use your phonic cards to practice these sounds, make words for your child to read and encourage your child make words using the sounds, for example, dog, mat, dig, pin, etc. 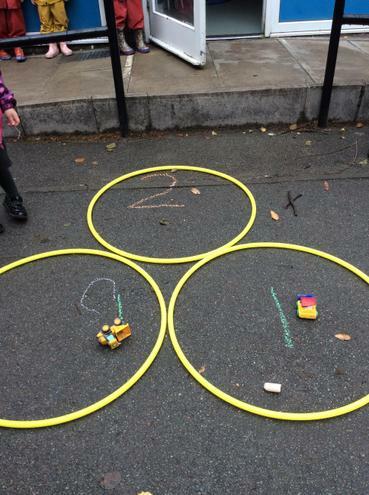 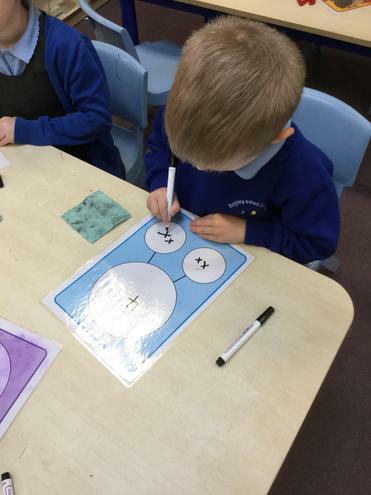 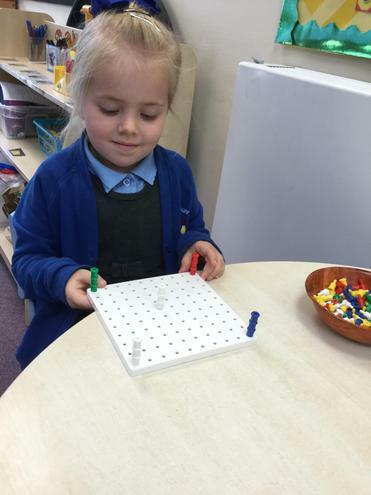 In maths we have been using the part part whole model to begin to find ways of making 2. 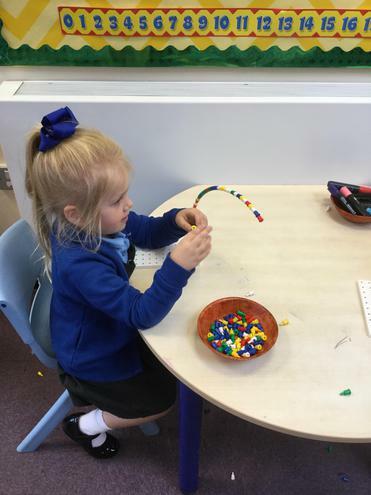 At home you could use string or similar to make a part part whole model and practice finding ways of making 2. 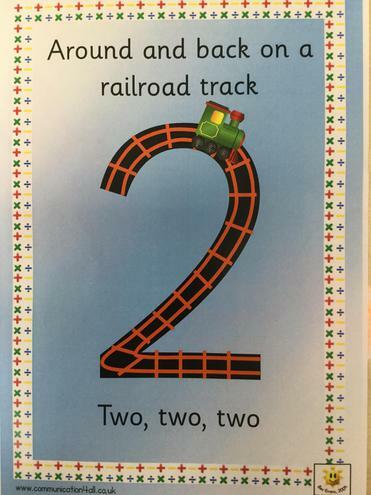 You could also practice writing the number 2. 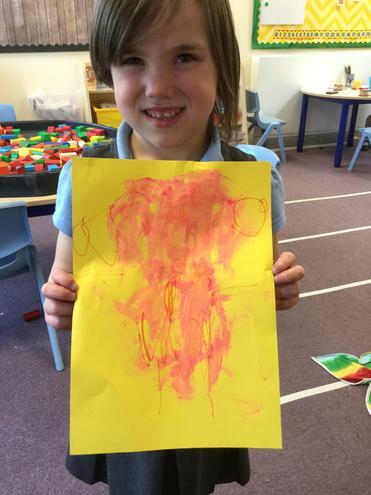 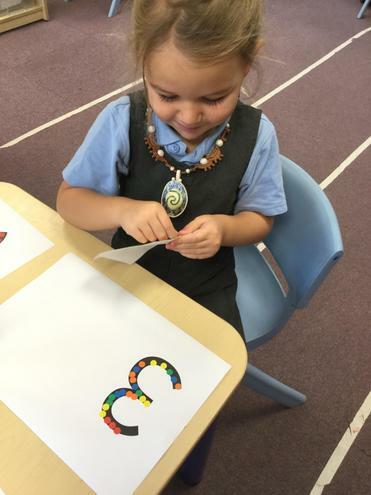 For our IEYC (International Early Years Curriculum) this week we have been looking at letters and envelopes. 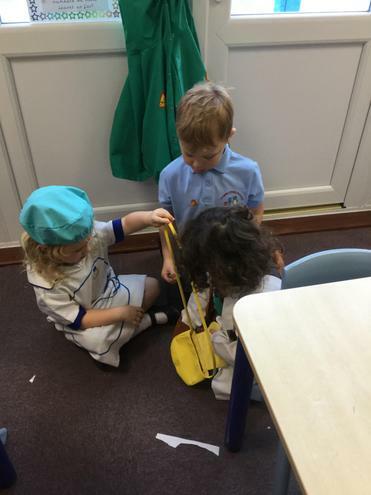 We had a delivery of envelopes but there were no names on the envelopes so we had to open the letters and use our phonic knowledge to read the names inside the envelopes. 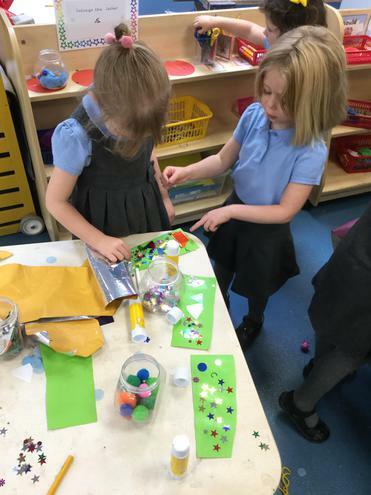 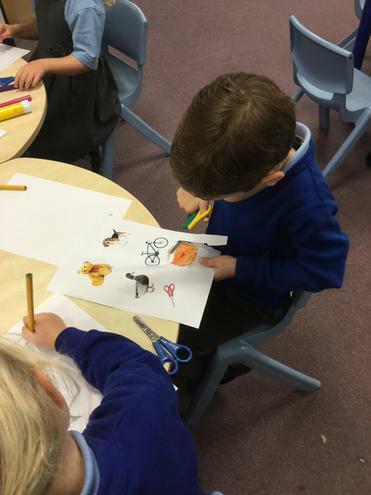 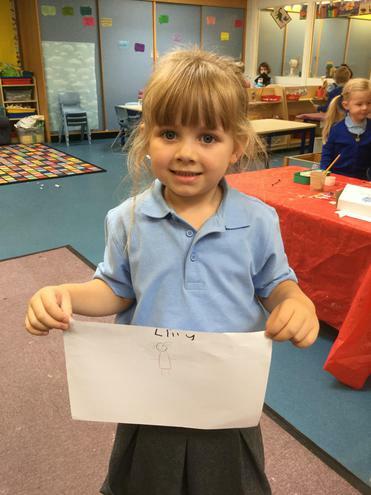 Then we made a picture for our friend, made our own envelopes and made sure that we named them properly so it was easier to deliver them to the right person! 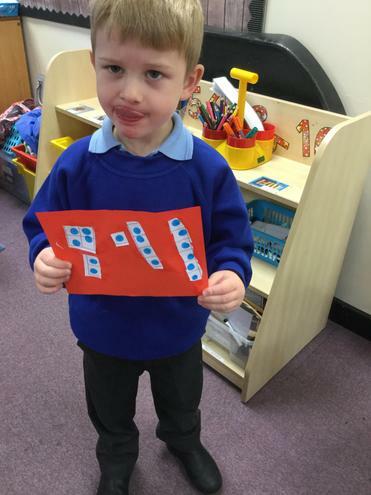 In English this week we have started to learn to read and write some of our letter sounds. 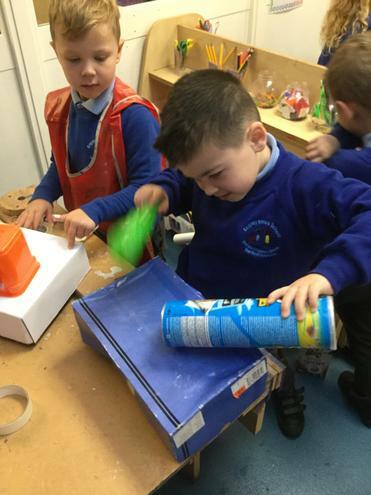 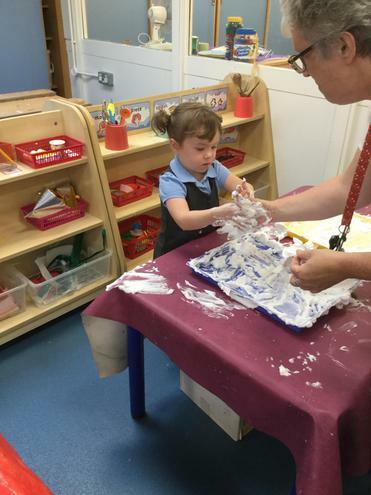 We have practised writing the letter sounds in lots of messy things like shaving foam and cornflour. 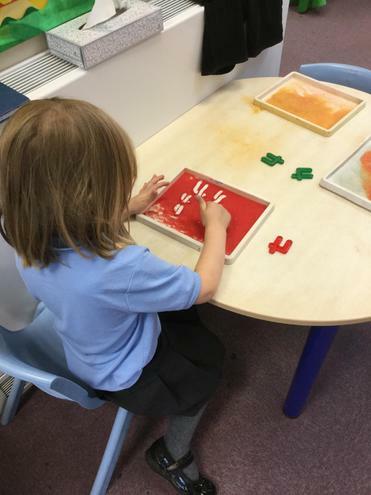 At home please could you practice writing these letters, making sure that they are formed correctly. 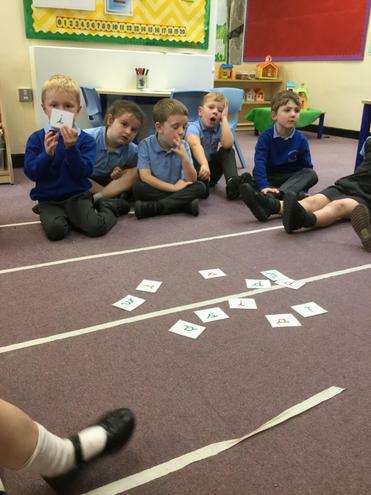 Below are the sound cards with the rhyme to write each sound. 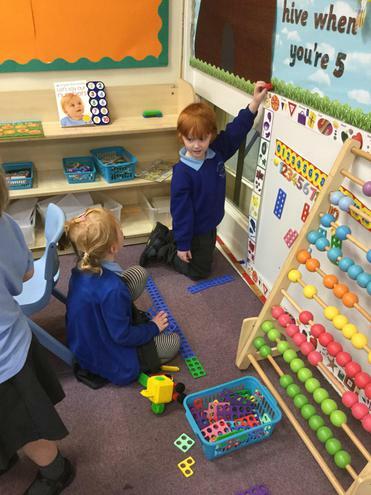 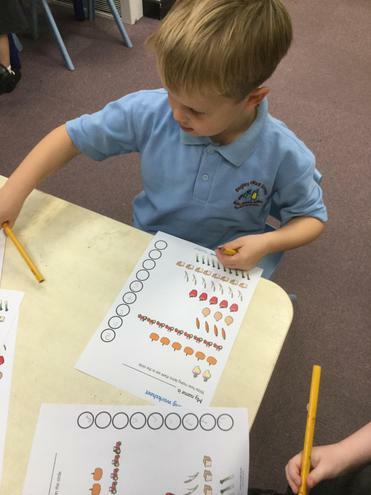 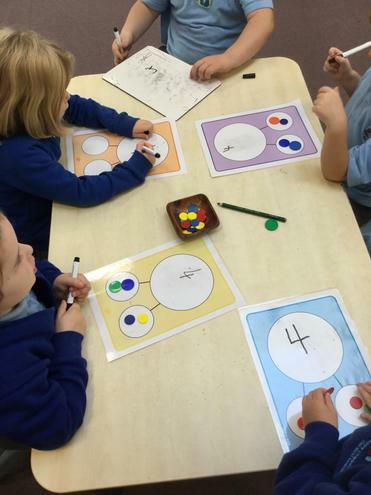 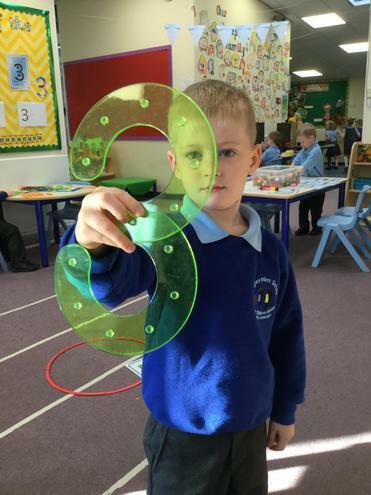 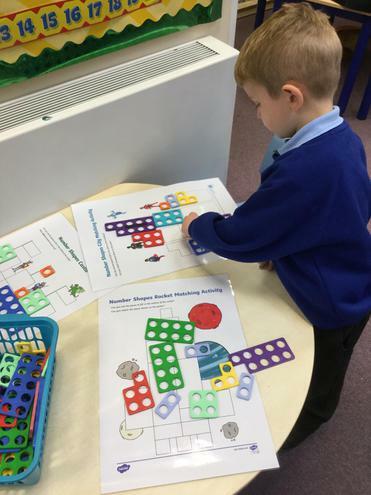 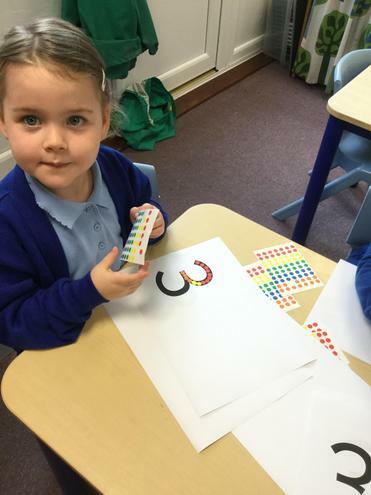 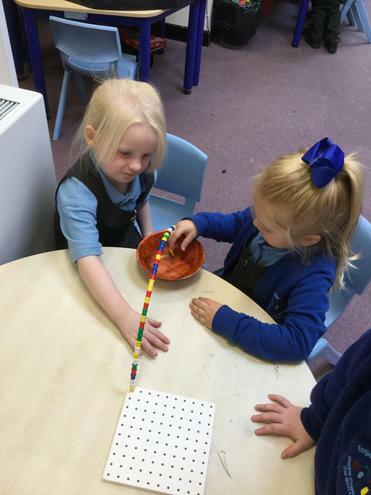 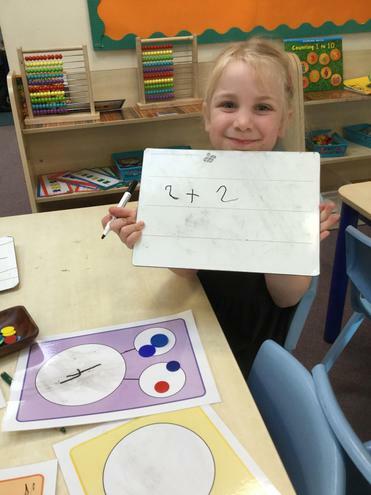 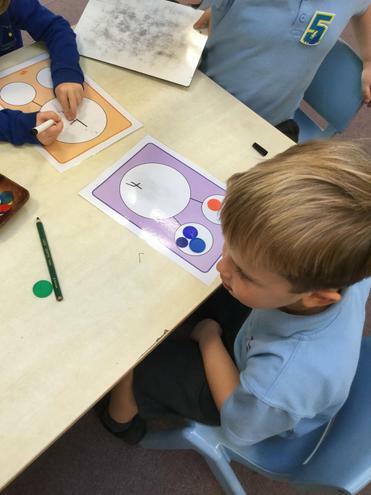 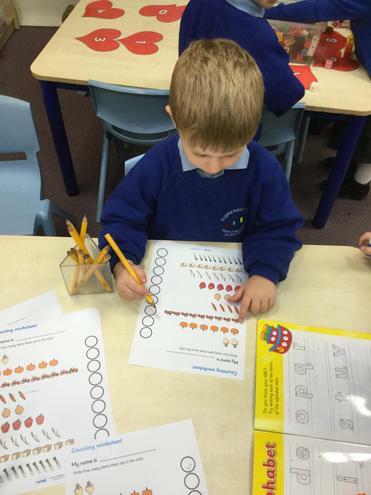 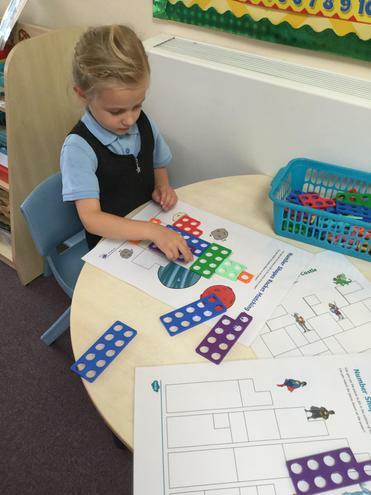 In Maths we have been exploring the numbers 1 and 2. 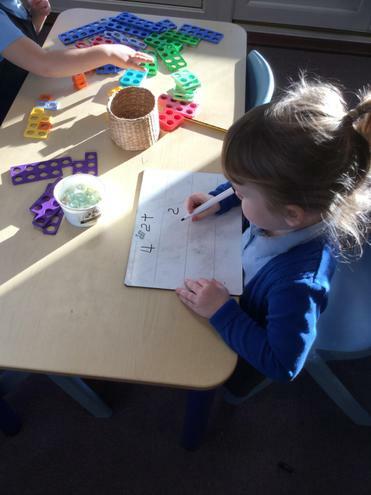 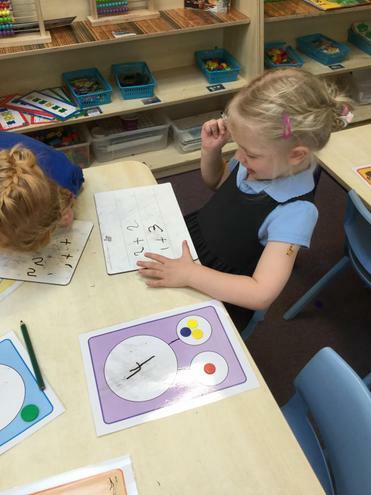 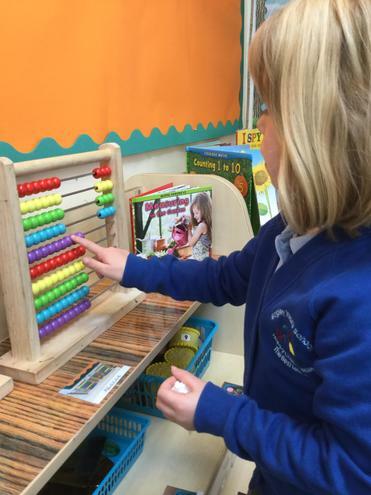 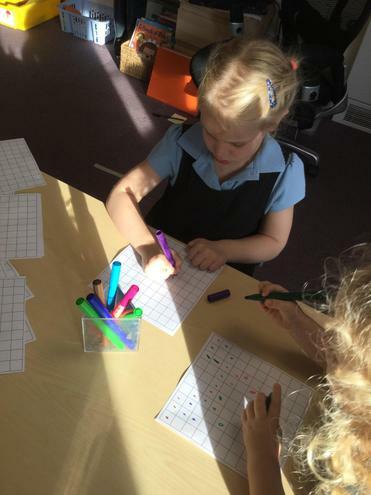 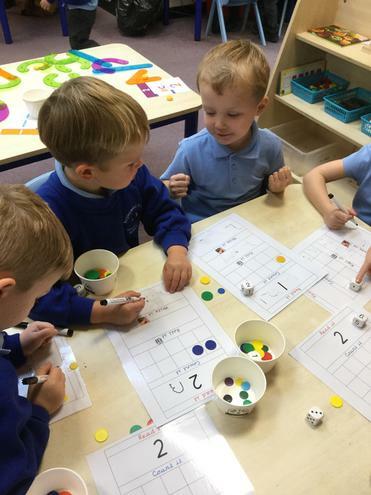 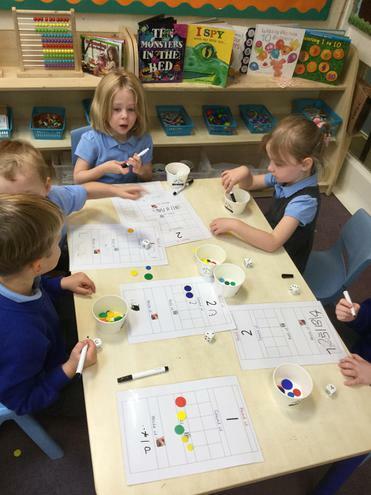 We have learned how to read, count, write and make sets of the numbers. 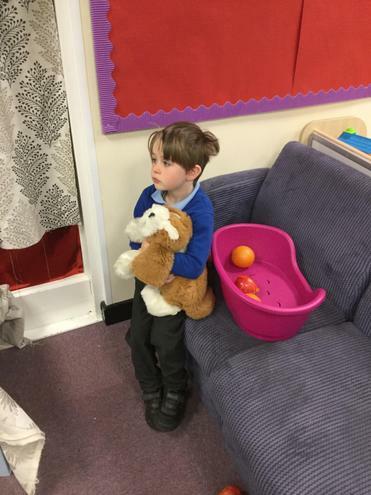 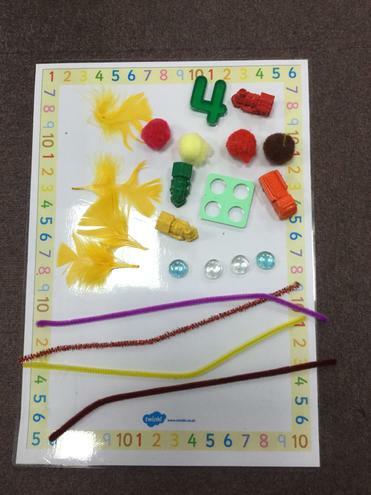 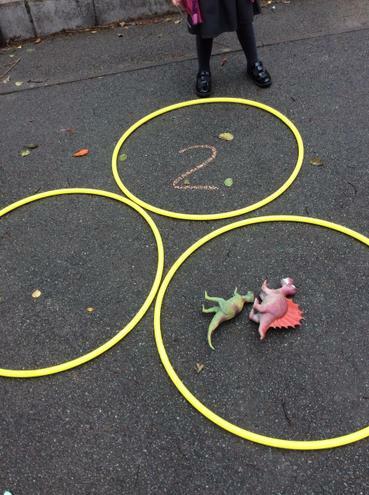 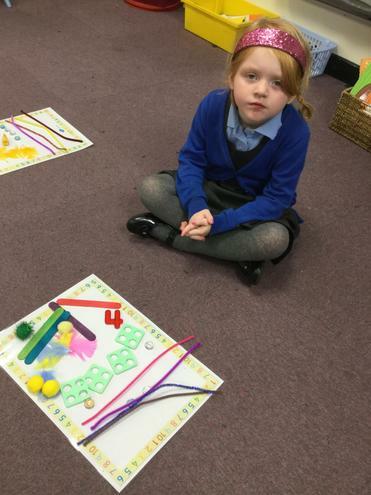 At home please can you practice making sets of 1 and sets of 2 using items from around your home. 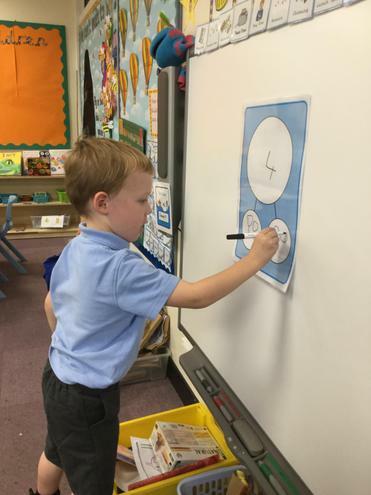 You could also practice writing the numbers, we know that when we write our numbers, we start at the top. 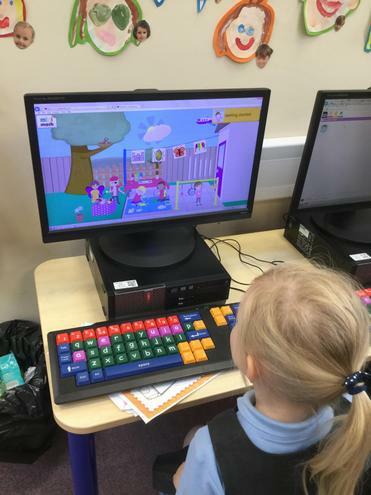 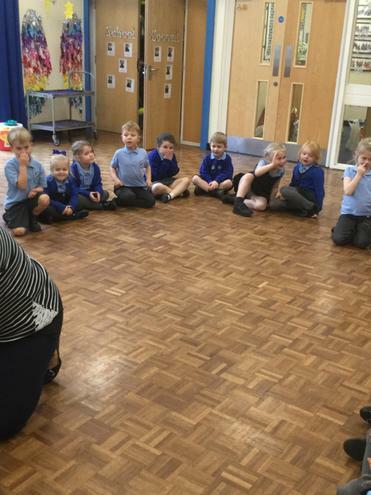 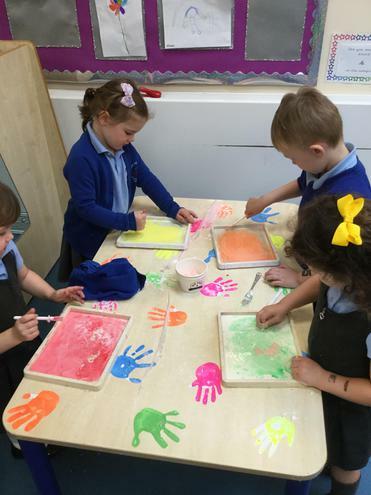 We have started our IEYC (International Early Years Curriculum) journey this week. 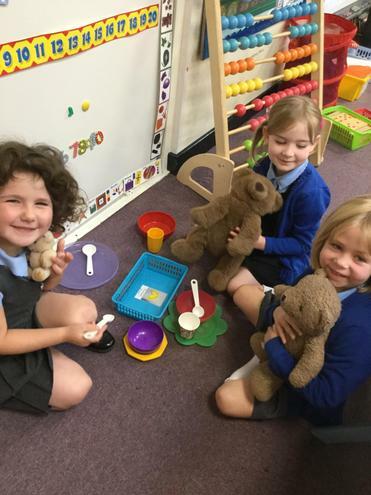 We have introduced ourselves to our puppets 'Carlos', 'Ringo' and 'Kimberly'. 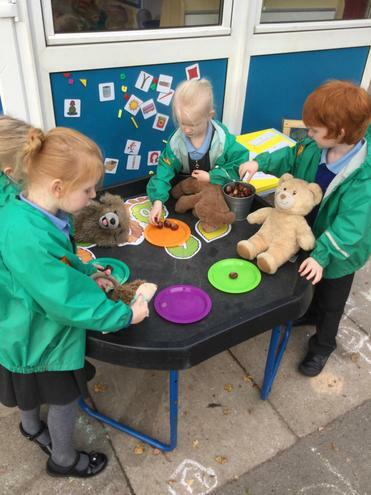 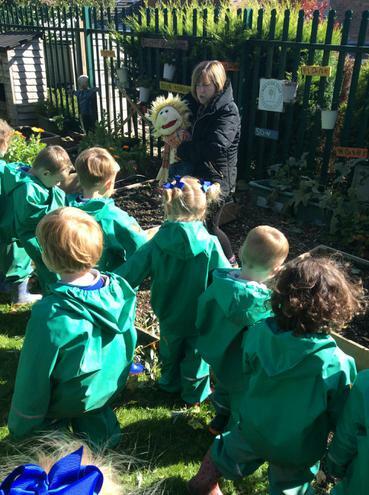 We have shown the puppets around our classrooms and outdoor areas and told them where to find things. 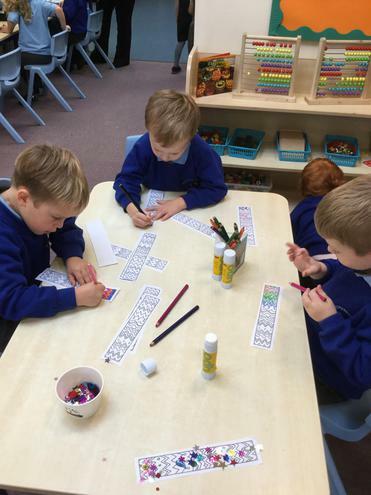 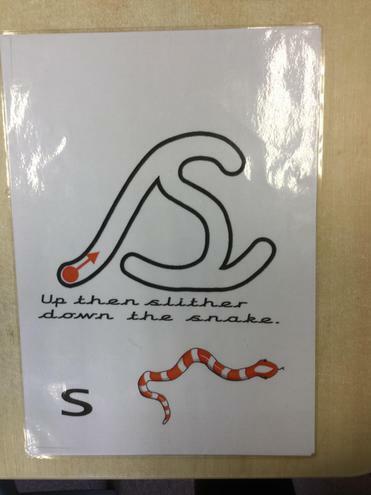 We have written labels for the different areas of the classrooms. 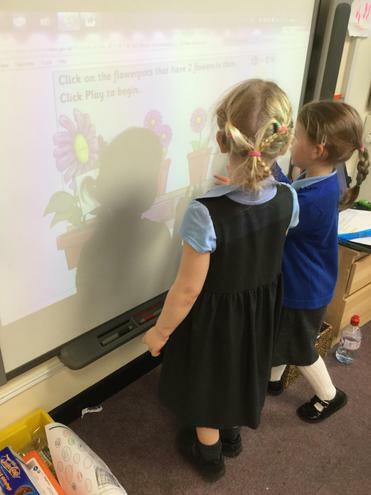 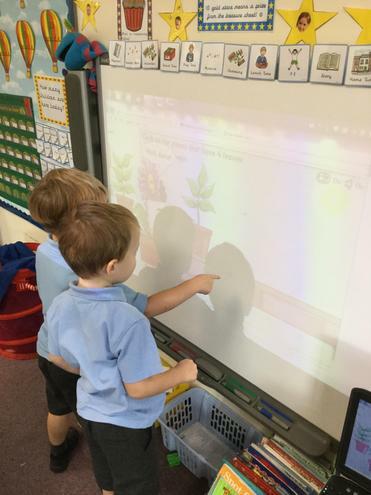 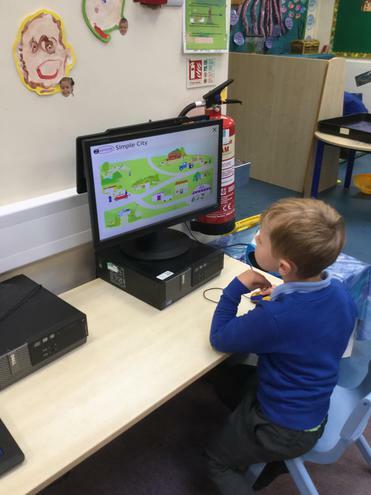 This week we have continued to find our way around our new classrooms. 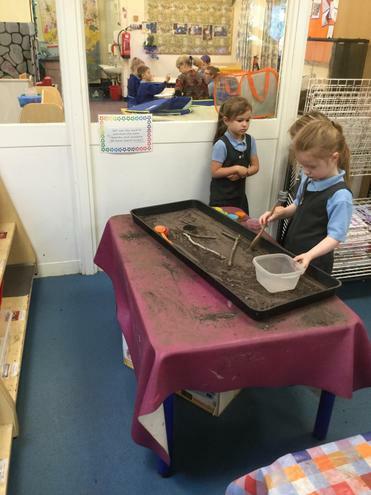 We have worked with our teachers, showing them what we know. 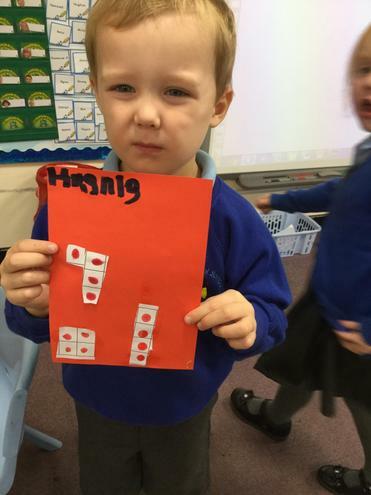 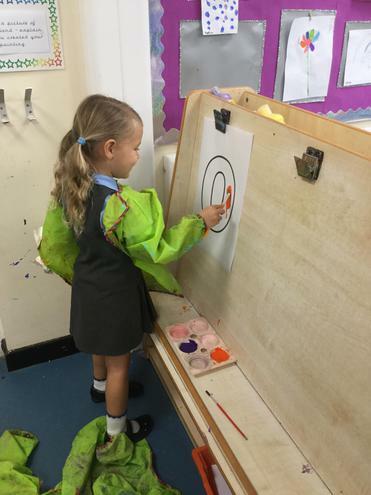 Next week we will start learning all about the number 1 and some of our letter sounds. 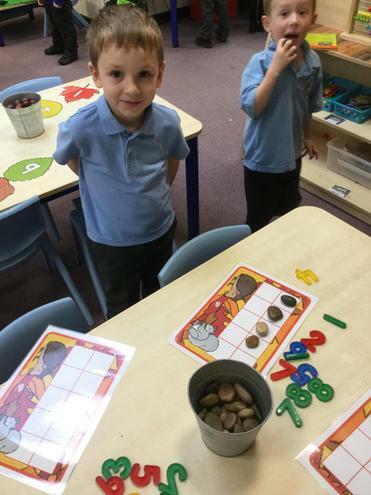 We will learn the name of the letter, the sound the letter makes and how to write the letter with the lead in and lead out. 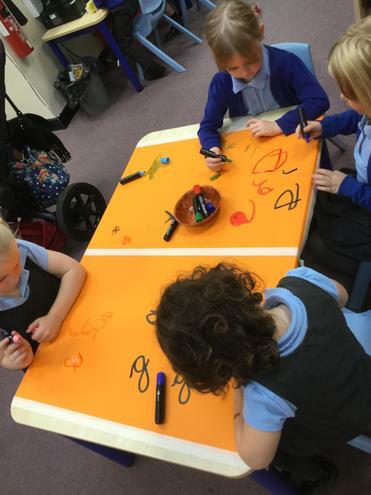 At home you could support your child by practising writing their name with the lead in and lead out, a copy of these letters can be found in your welcome pack from Thursday's meeting. 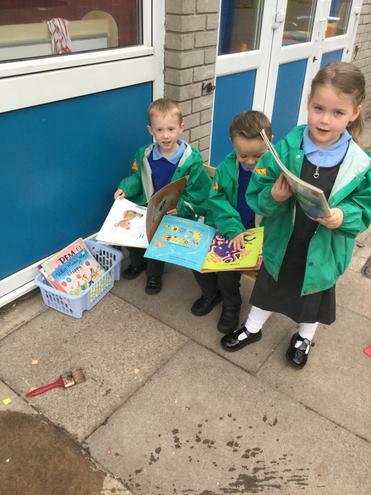 Our first full week at school completed! 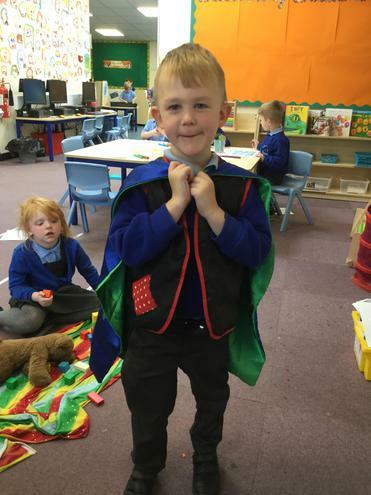 You should be so proud of us all! 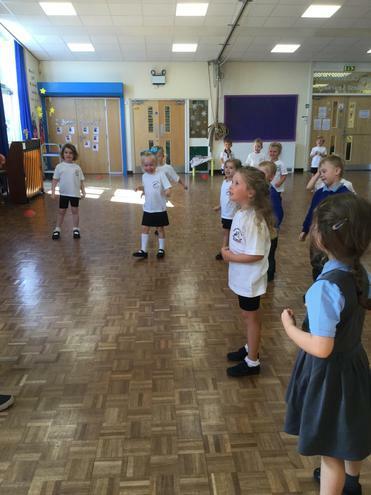 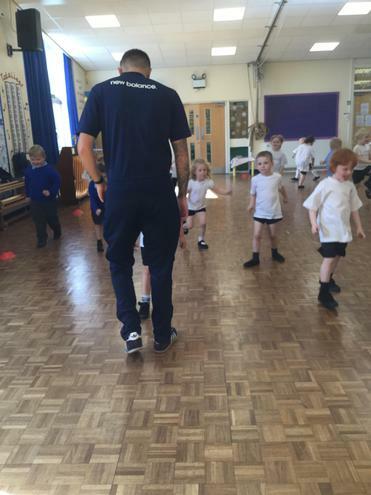 We are settling in very well and we are getting to learn our new routines and where things go. 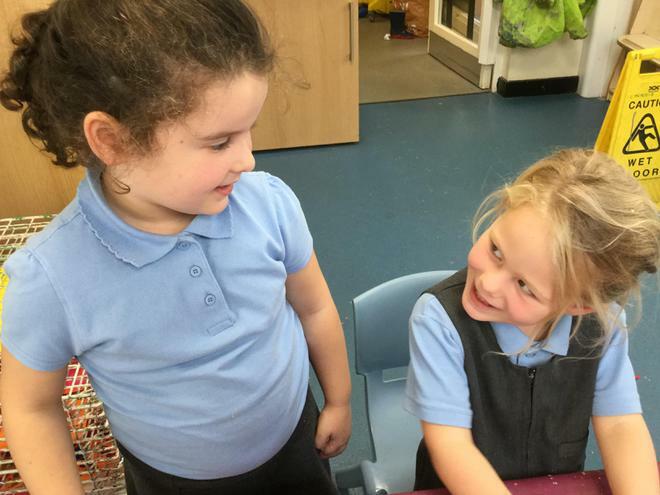 We have had so much fun making new friends!